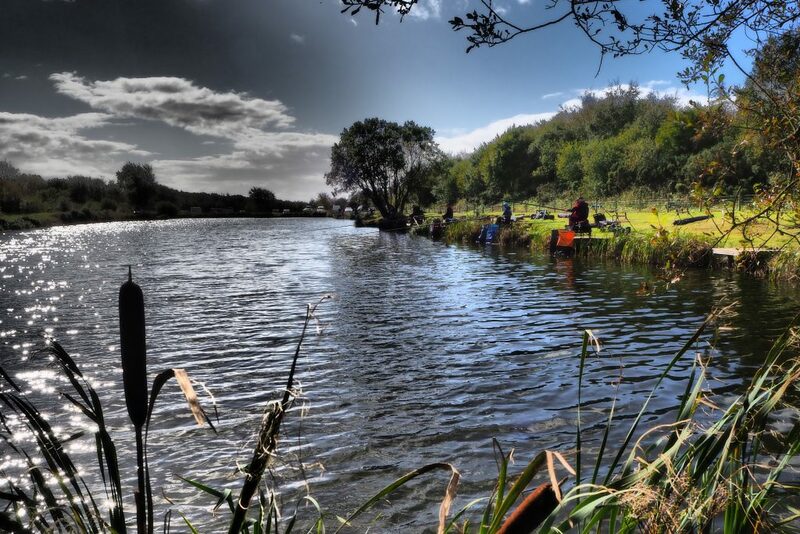 We’ve had a fantastic response again this year with 12 teams (36 anglers) now registered. 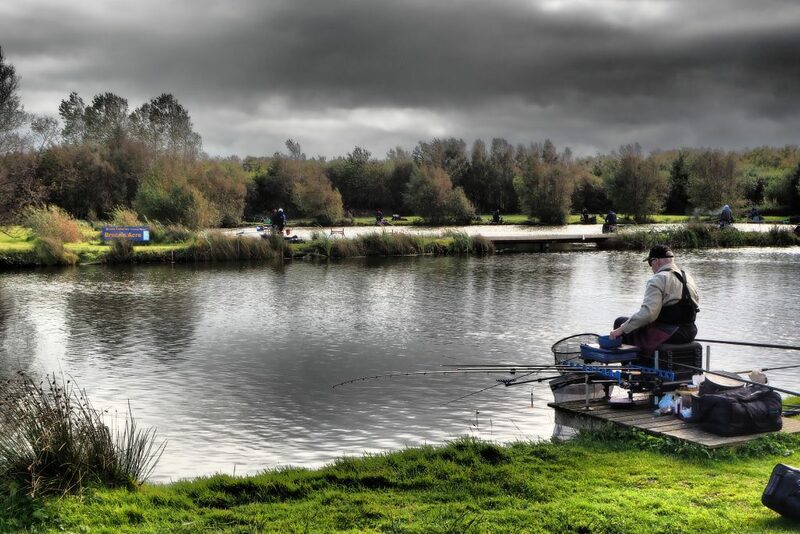 There are a few changes to this year’s league to make things more competitive and a bit fairer. 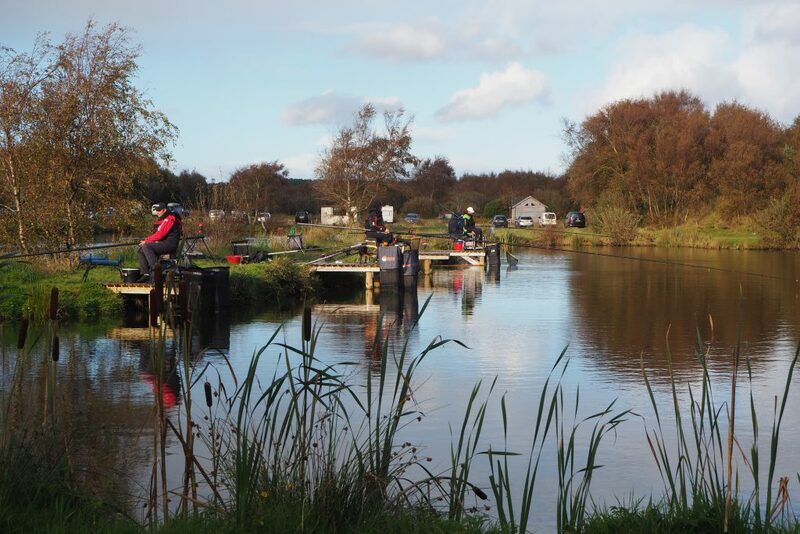 The league will be split into 6 ” mini-sections” of 6, based on the 36 anglers registered. 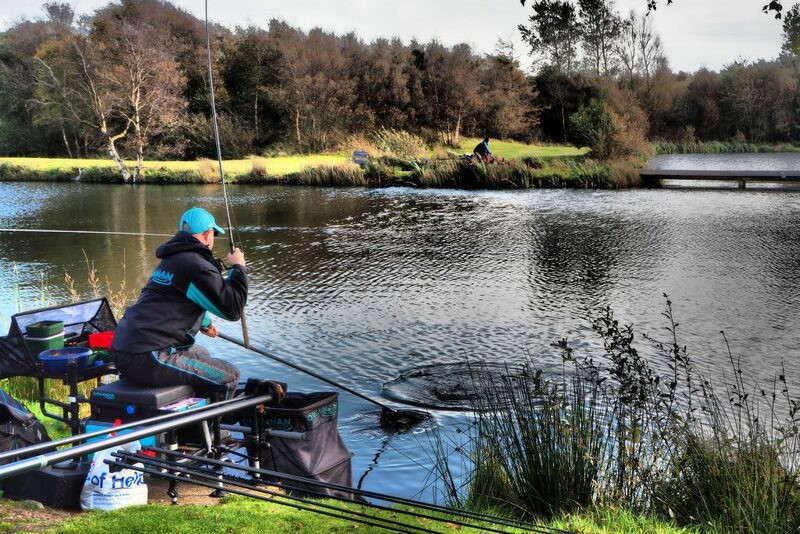 NO TEAM will be allowed to draw more than one end peg. * NOTE * IF the Golden peg is not won during the league, it will become an extra prize, split between the top team and top individual at the end of the league. 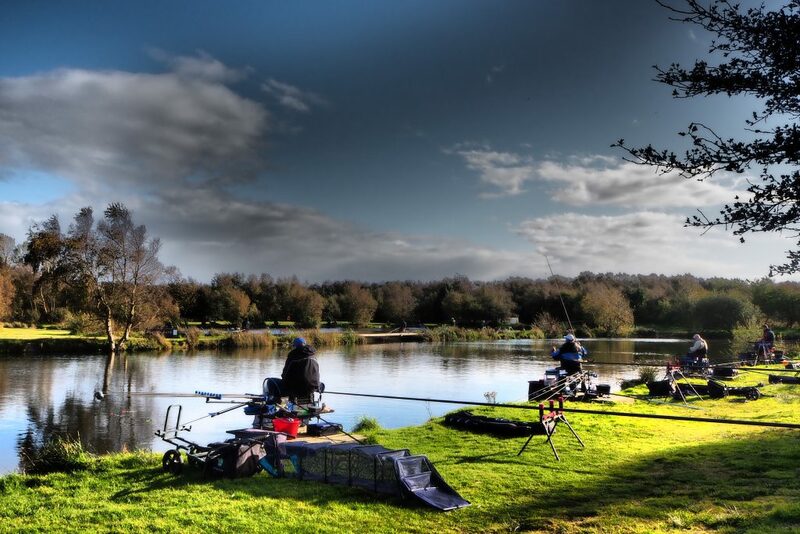 Lastly… There’s also the £1000 worth of Daiwa tackle vouchers up for grabs, split between top teams / top individuals. 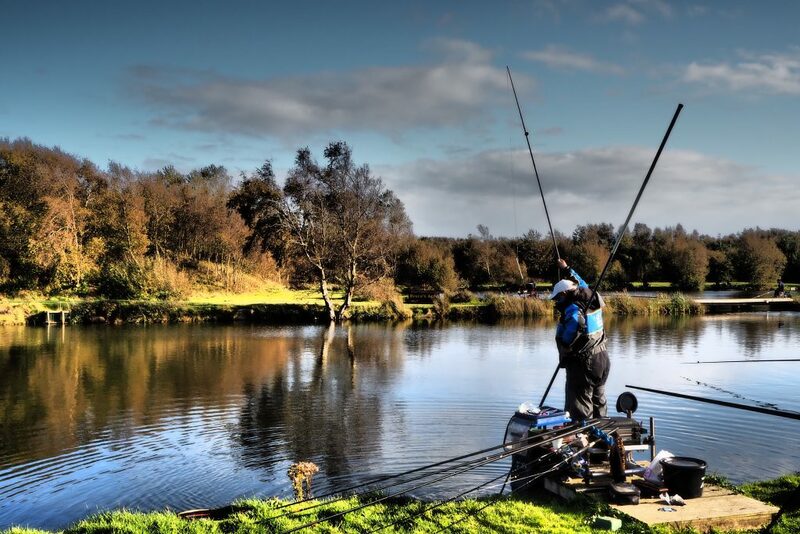 Lots of payouts, lots of prizes and lots to fish for every round..! 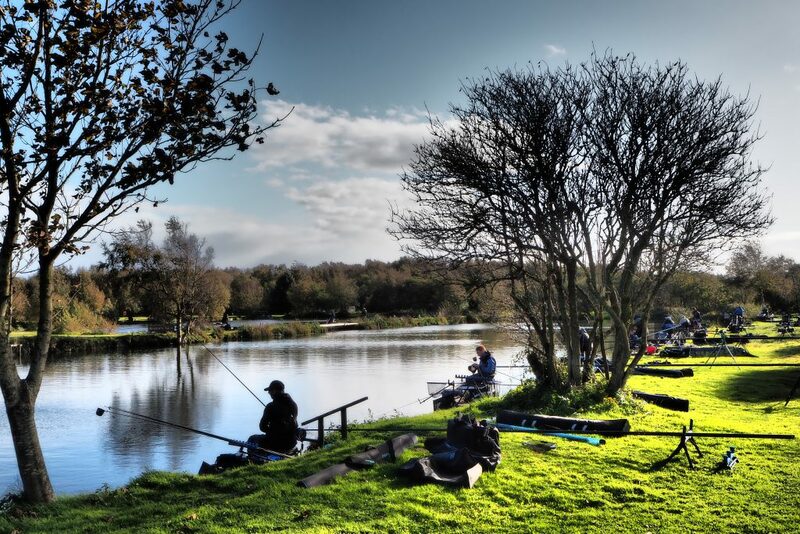 For a full rundown on the teams/anglers registered scroll through the page to find the previous post regarding the league. 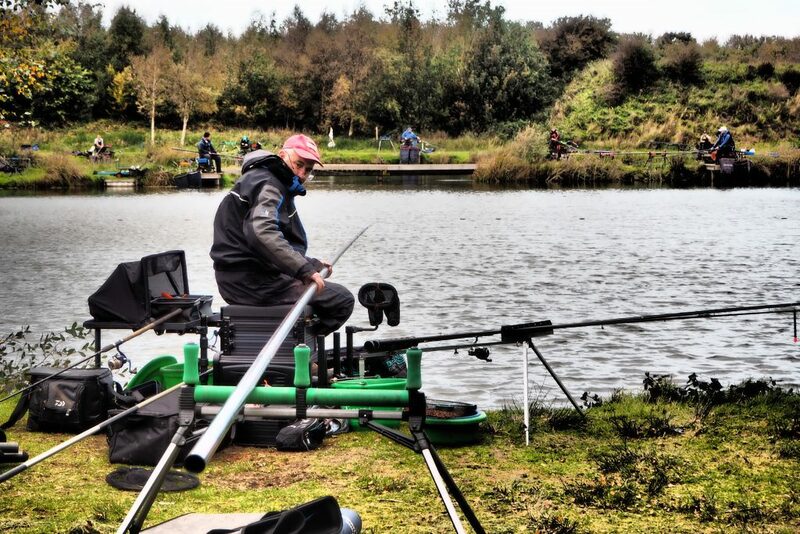 Many thanks to all who’ve supported this very popular event, I’m sure it will be another fantastic league at Broom. 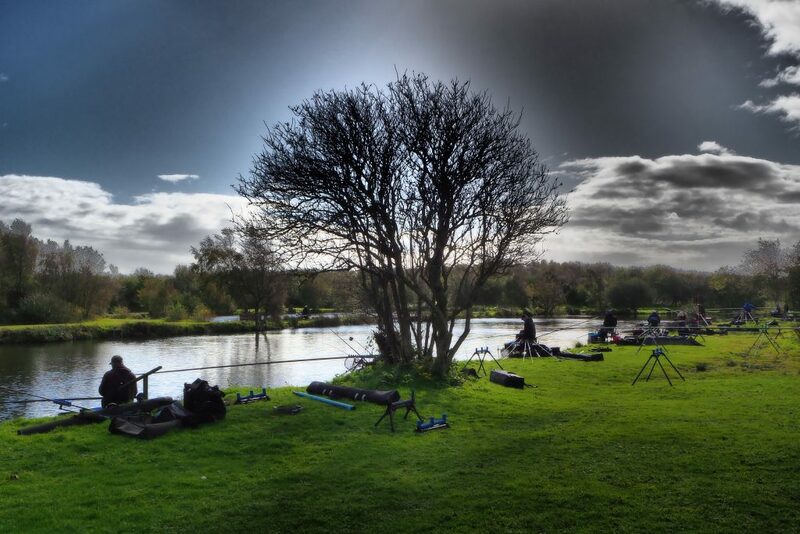 Many thanks to David Mcauley / Daiwa for their continued support and choosing the fishery to host the event.! 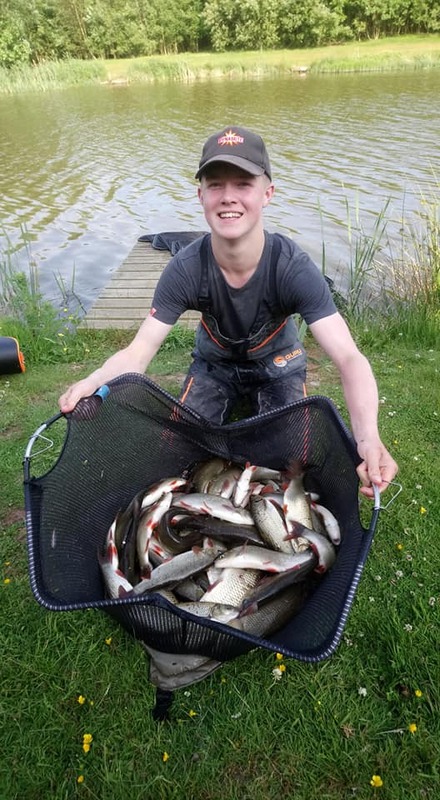 Broom fisheries – Broom Super League (. 3 – man team.) 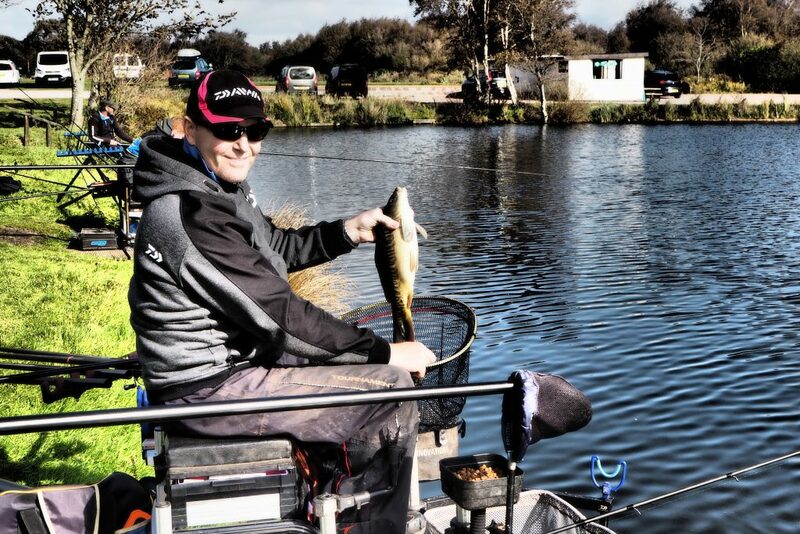 sponsored by Daiwa. A lovely dry but very bright 🔆 day today, odd gusts up to 15 mph and the odd rumble of thunder ⚡…! 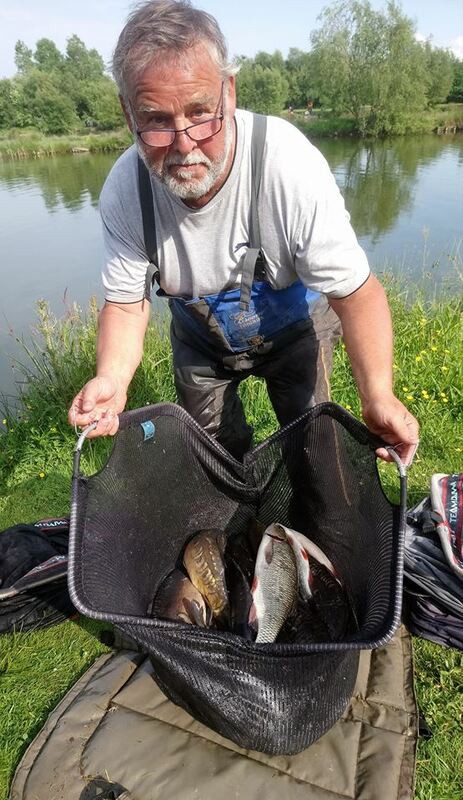 Some very good weights considering the bright sunshine, but bites were a little shy in places with short spells of activity throughout the day. 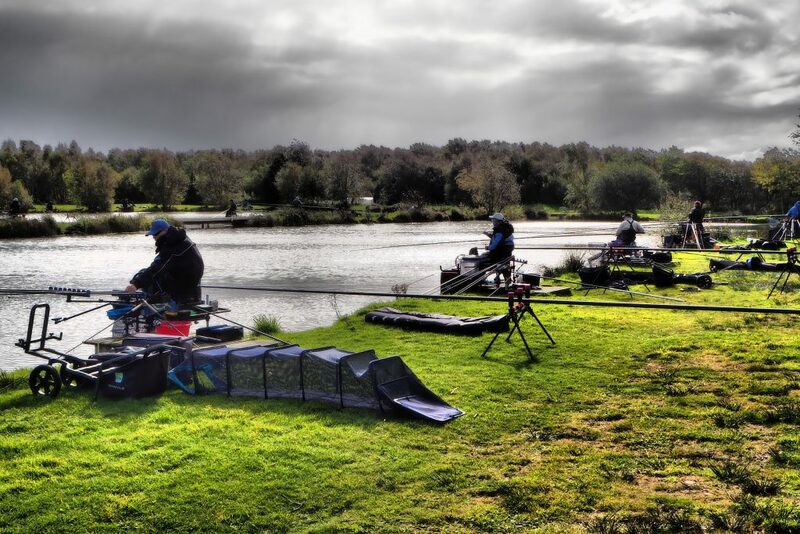 The return of the 3 – man team league sponsored by Daiwa saw another great turnout, with a very strong field. 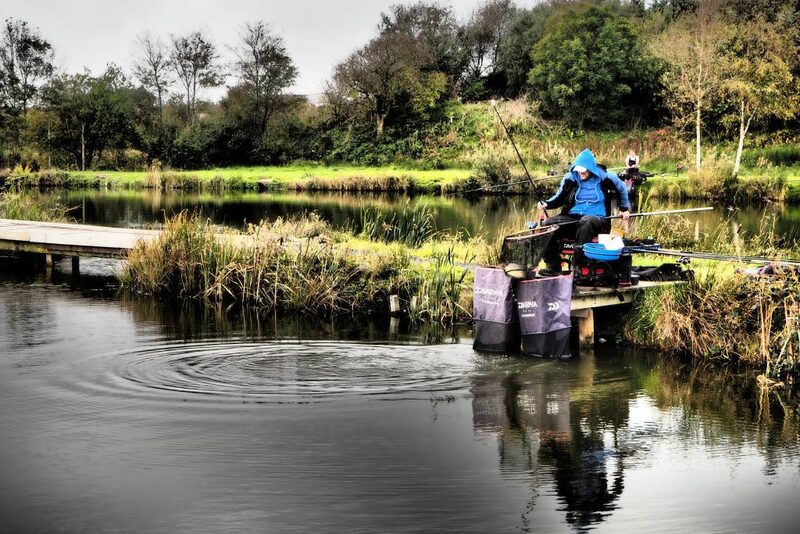 Smaller sections this year to make the league more competitive, and competitive it was.! Last years defending champs ” Broom DYNAMITE” drew reasonably well, with young up and coming starlet Rob Swan drawing end peg ( and Golden peg.) 46 on Wallace Lake, and he didn’t disappoint. 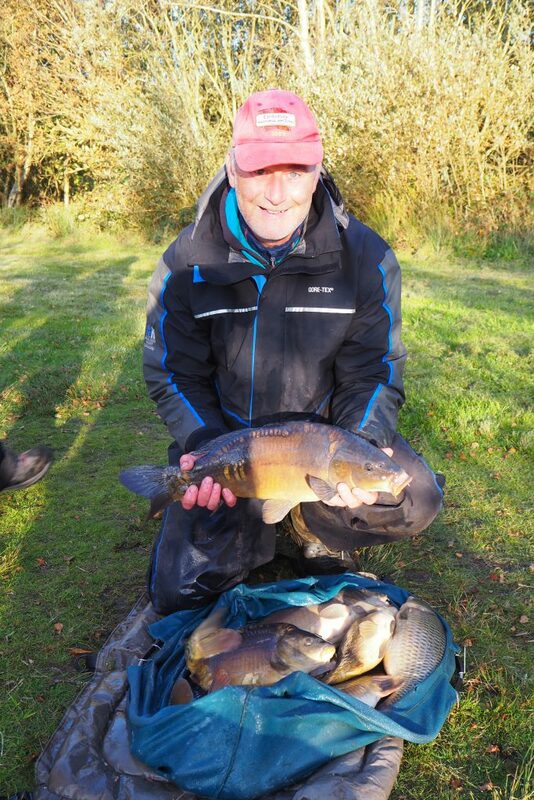 A cracking 97lb won him and his team a section win, individual win, team win and the golden peg, scoring 1pt to add to Steve Royle 2pts and Barry Youngs 4pts, giving them a 7pt total and winning overall on weight on the day. 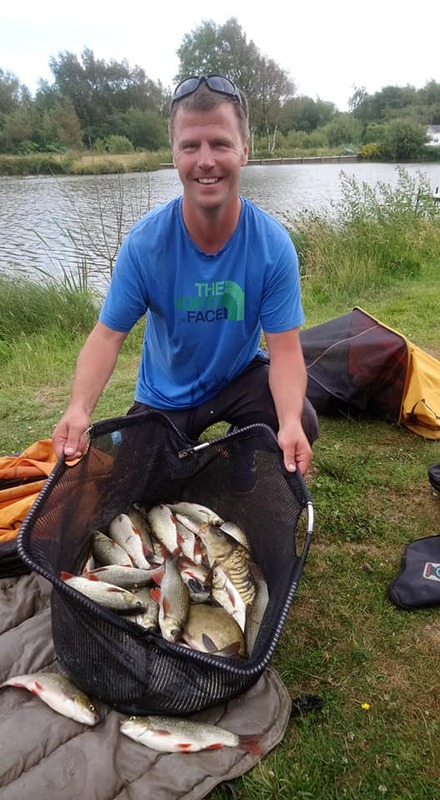 Also tied on 7pts were the ” Bulgarian Baggers” with Myles Watt scoring a 2nd, Rosen scoring a 2nd and Thomas Woodman a 3rd place giving them a worthy 2nd placed team on the day. 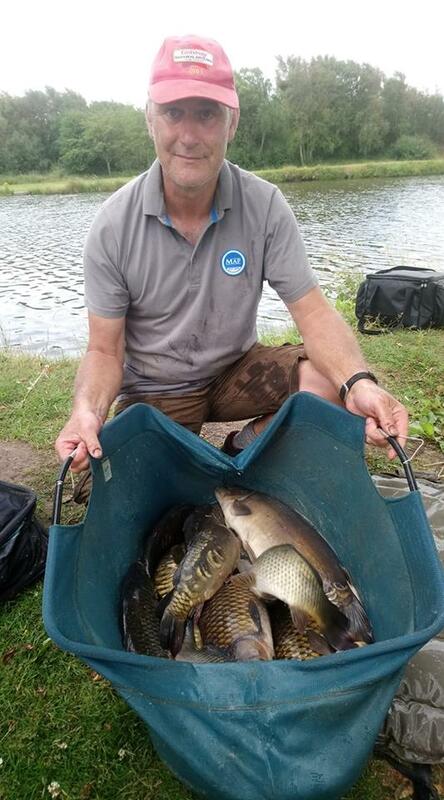 Broom “A” also scored 7pts on the day, John Wright a 1st, Don Lines a 3rd and Mark Clow a 3rd, just missing out on weight. Nice to see the Broom teams dominating on Day one, but a long way to go. 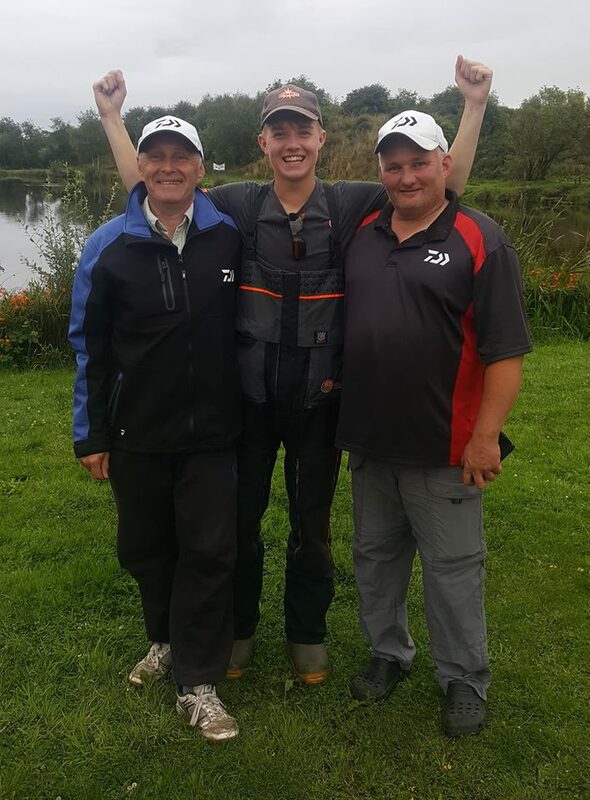 Elsewhere Ian Whitson scored a section win for Daiwa ” A” with 50lbs 2oz, and also David Mcauley of Daiwa ” A” scoring a 1st with 44lbs 8oz. 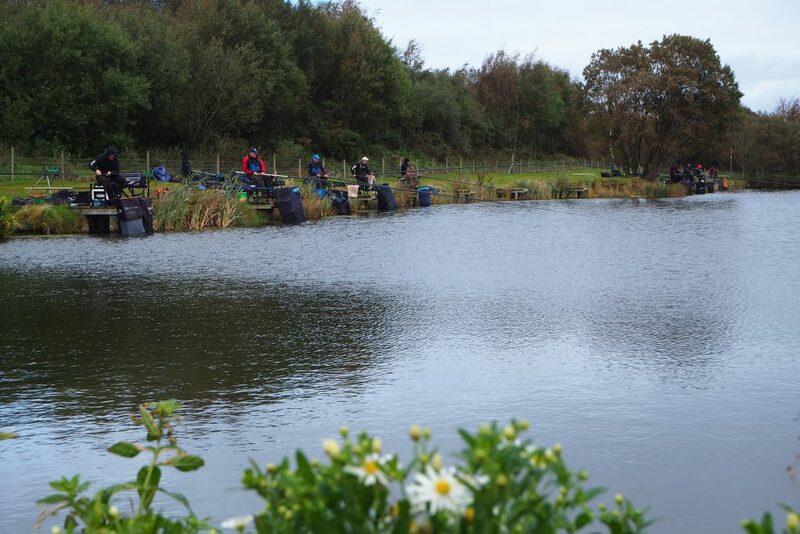 A great start to the league, many thanks to all who ve supported the event and the fishery. 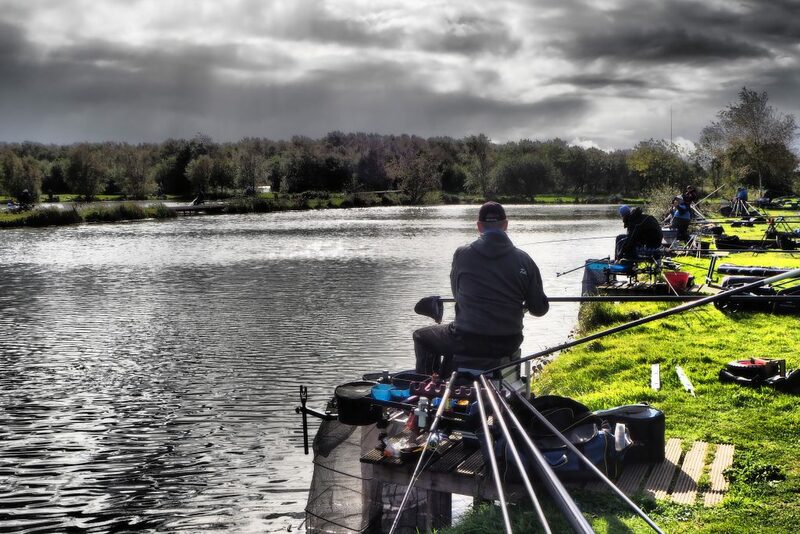 Weather wise conditions were close to perfect, overcast with periods of sunshine, winds around 15mph with the odd gusts throughout the day. 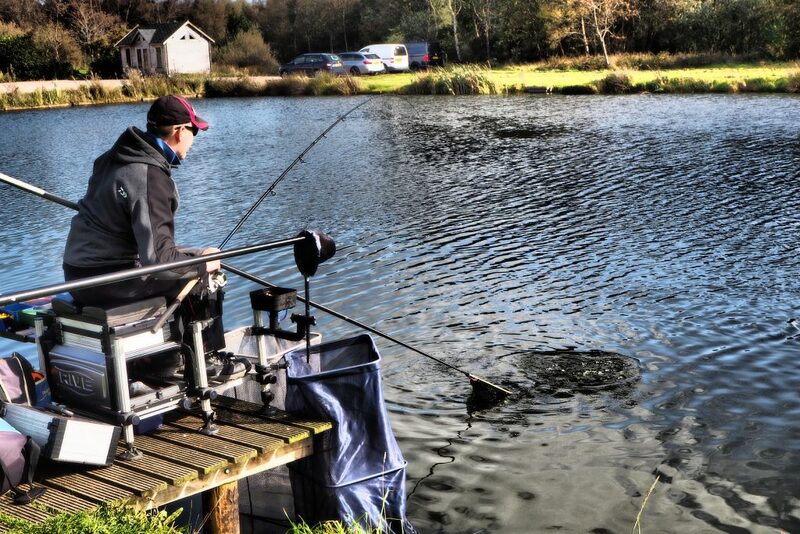 What a day for the fish to decide to feed, with fantastic weights recorded on all 3 waters. For those of you who like ” Stats”, an awesome total weight of 1350lbs 5oz was weighed in today..! 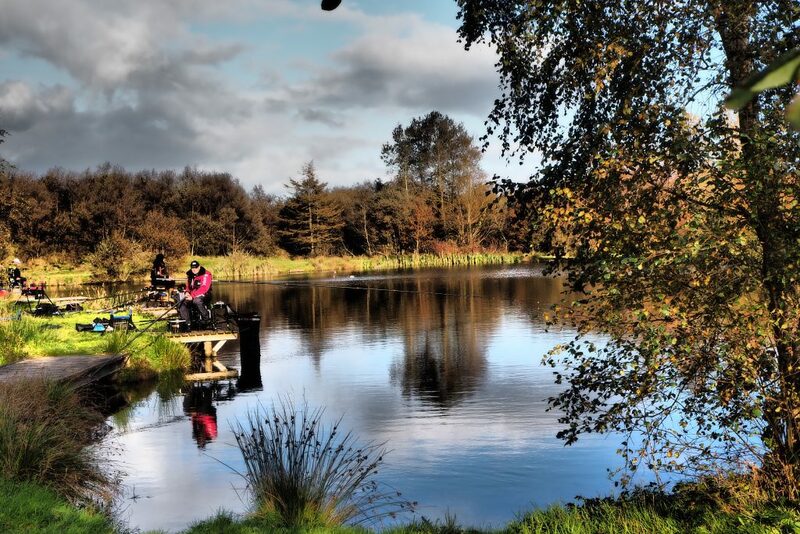 Bruce’s Acre section 1 is probably the best place to start, where the fisheries 3rd ” Ton” of the year was recorded..! Rob Swan (. BROOM DYNAMITE.) 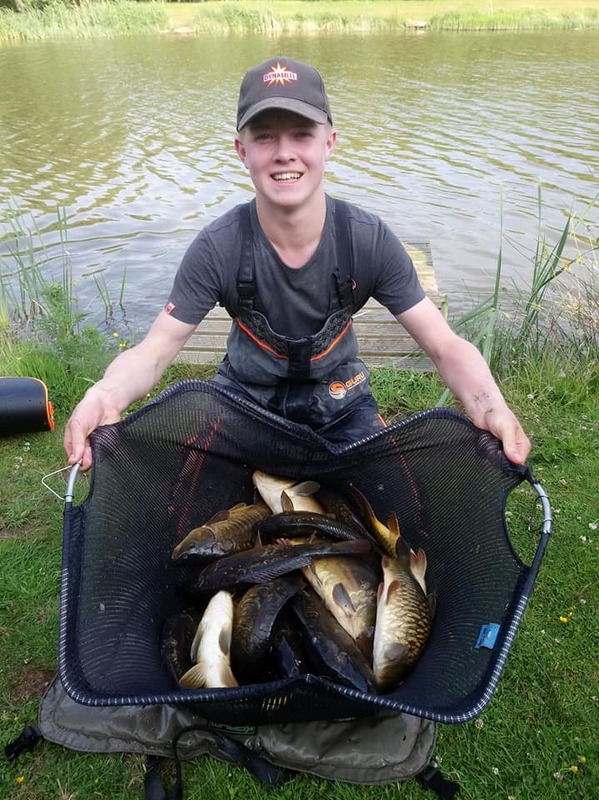 Drew peg 4 on section 1, and what a day he had, weighing in 110lbs 10oz of carp caught on pellet / pole, winning his section and the overall match. 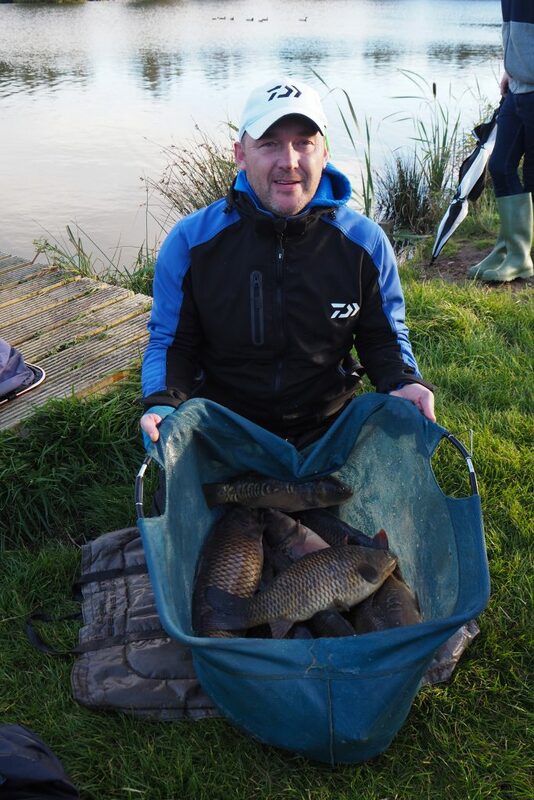 Craig Duncan ( Daiwa C.) took second place with 53lbs 4oz. 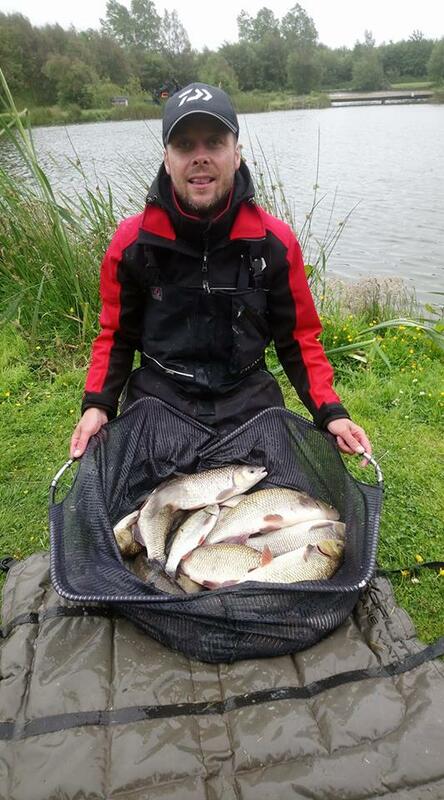 Section 2 also seen some good weights recorded, but a big mention has to go to Martin Greene (. Daiwa A. 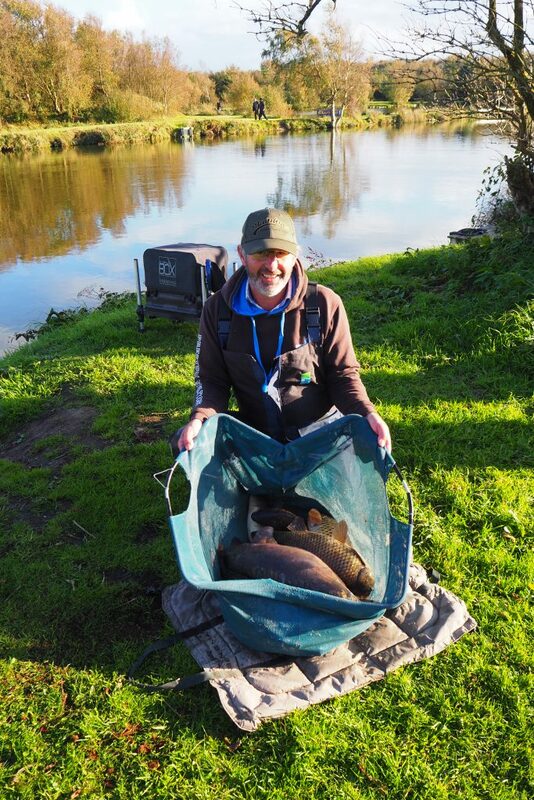 ), up against both culvert pegs, Martin drew unfancied peg 10, but put together an impressive 73lb 10oz net of carp to win the section. John Wright (. 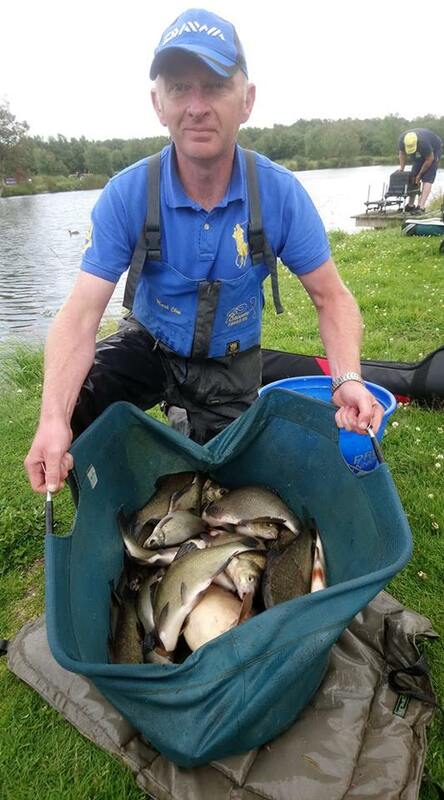 Broom Ltd.) was 2nd on peg 14 with another great weight of 61lb 4oz. 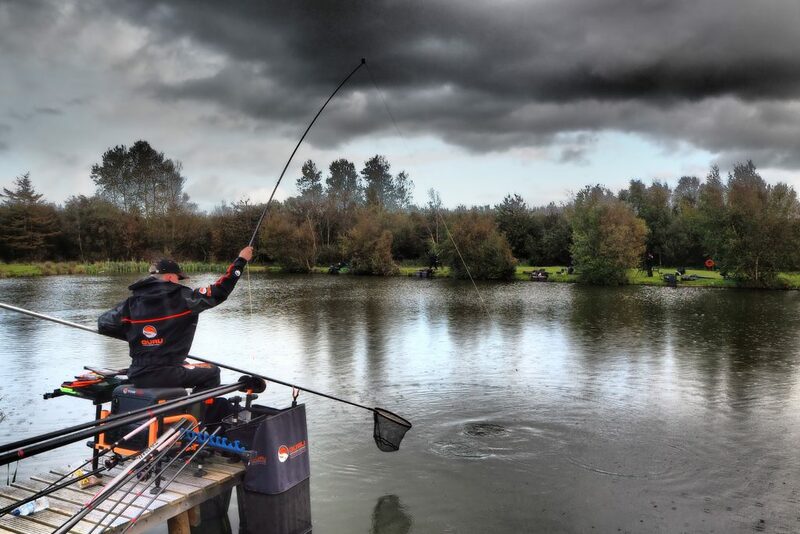 A very tough section to be in today with last in section Chris Yates still weighing in a superb 43lbs.. Showing just how well it was fishing. David Mcauley (. Daiwa A.) 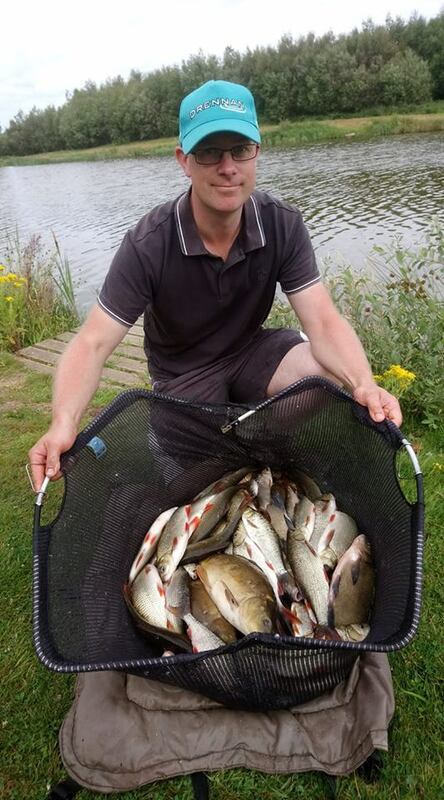 took second place with a lovely mixed net of chub, ide, skimmers and carp for 54lb 8oz. Section 2 and it was all about big weights yet again, Gerry Blythe (. The Arm Bandits.) 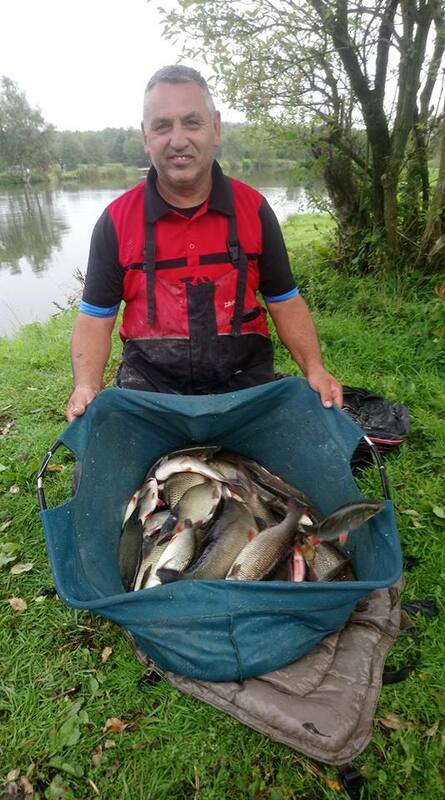 put in another sterling effort with a mix of chub, bream and carp for a fantastic 91lbs 14oz. Second in section was Mark Clow (. 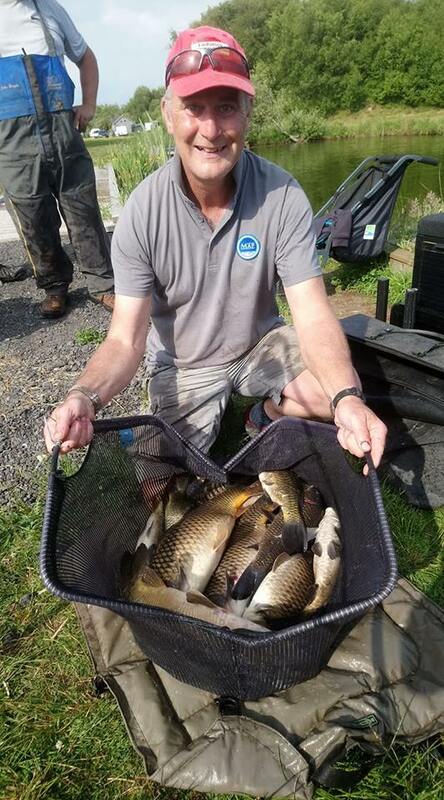 Broom Ltd.), who had a cracking net of skimmers and carp for 52lbs 8oz. 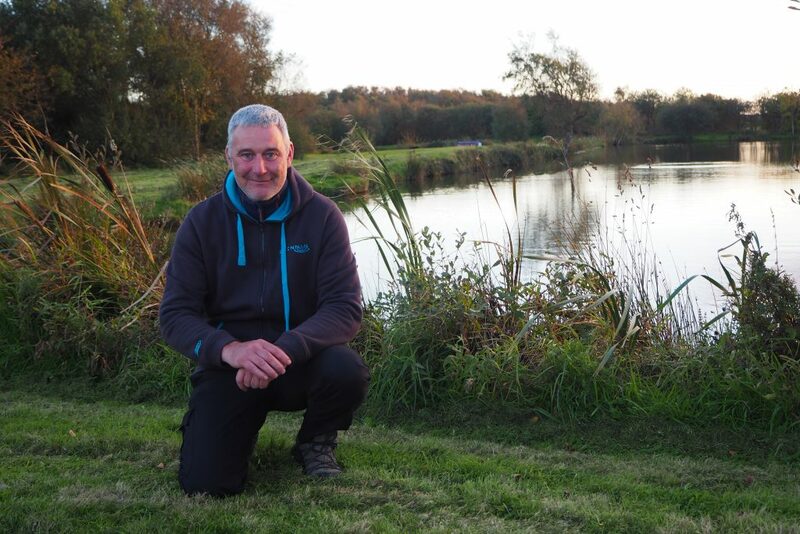 Top honors went to Andrew Gladwin on peg 34, catching carp on the method feeder to weigh in 44lb 12oz and the section win, a very close second was Mark Acton (. The Arm Bandits.) 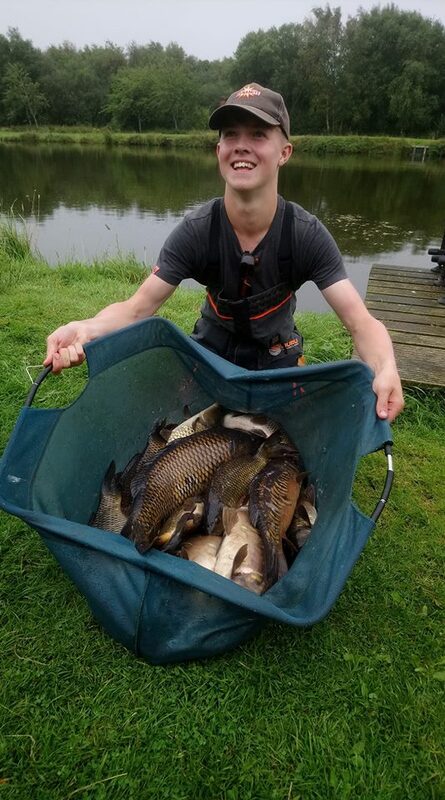 with a mix of small ide and carp for 40lbs 8oz. 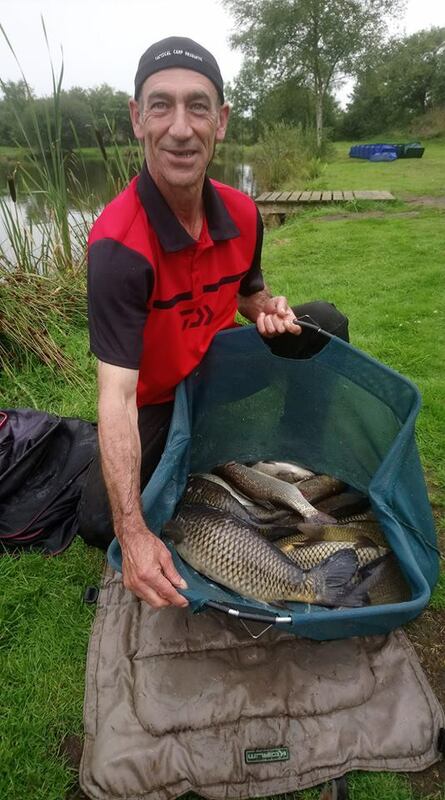 Another close one, Ian Whitson drew end peg 46 (. Daiwa A. 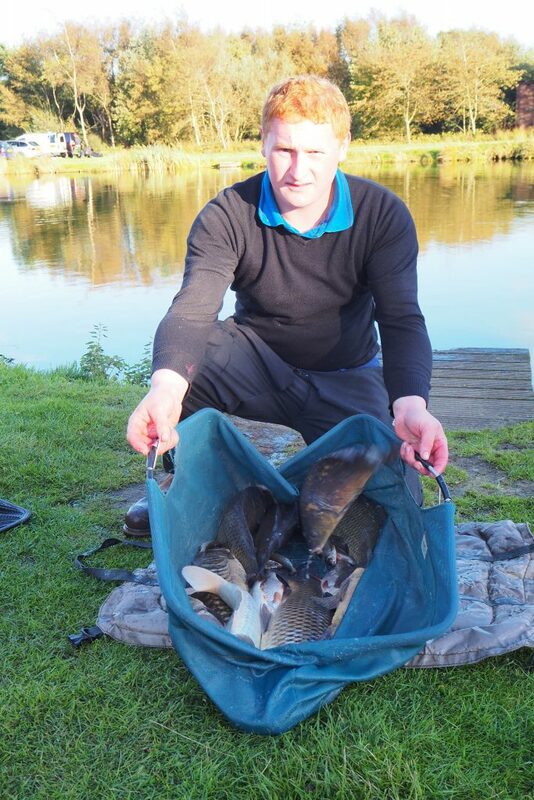 )and ran out the section winner with a few skimmers, ide and carp for 53lbs 8oz, all caught on pole. A close second was Barry Young (. BROOM DYNAMITE.) 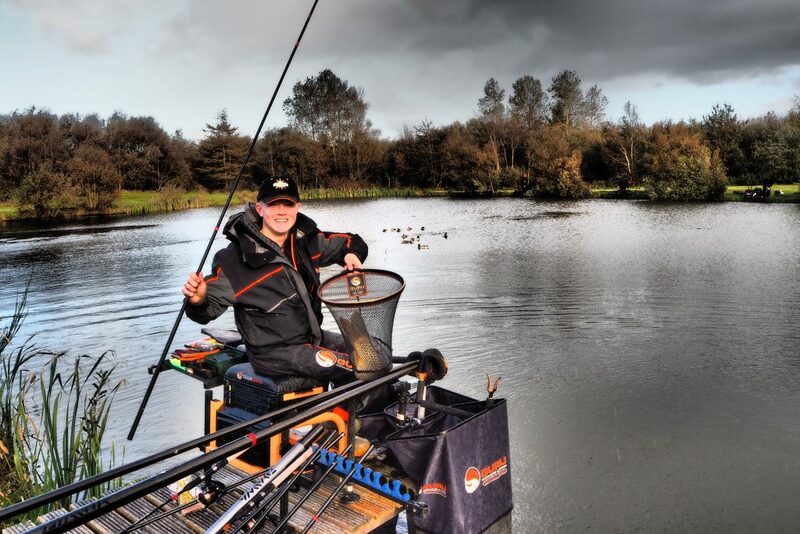 Catching perch, ide and carp on the pole to weigh in 48lbs on peg 42. 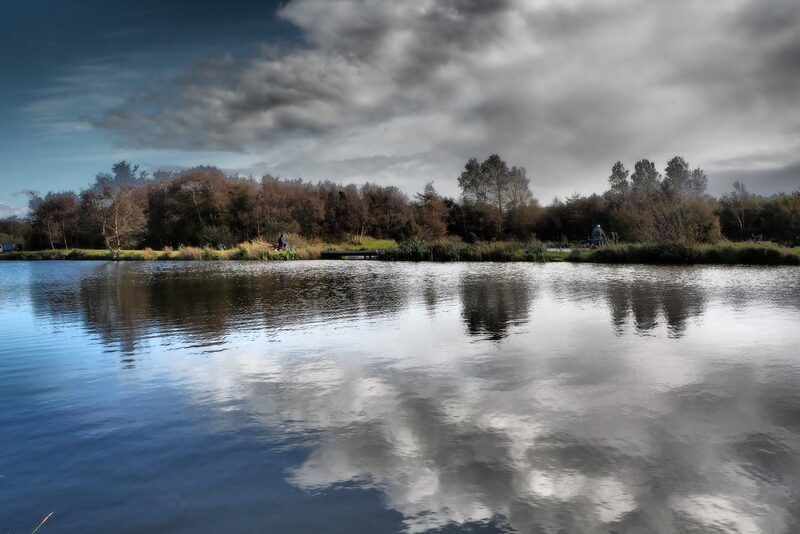 A cracker of a day at the fishery with superb weights throughout. 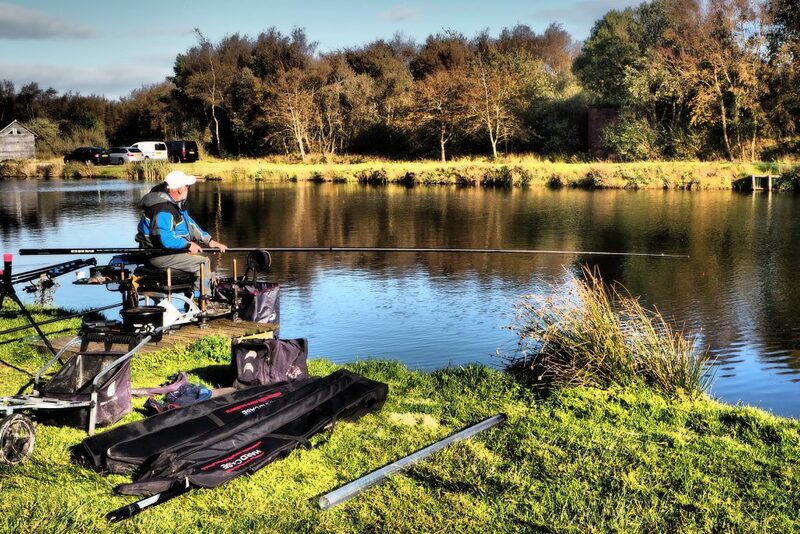 Thanks again to Daiwa and David Mcauley for their hard work and continued support making it all a success. 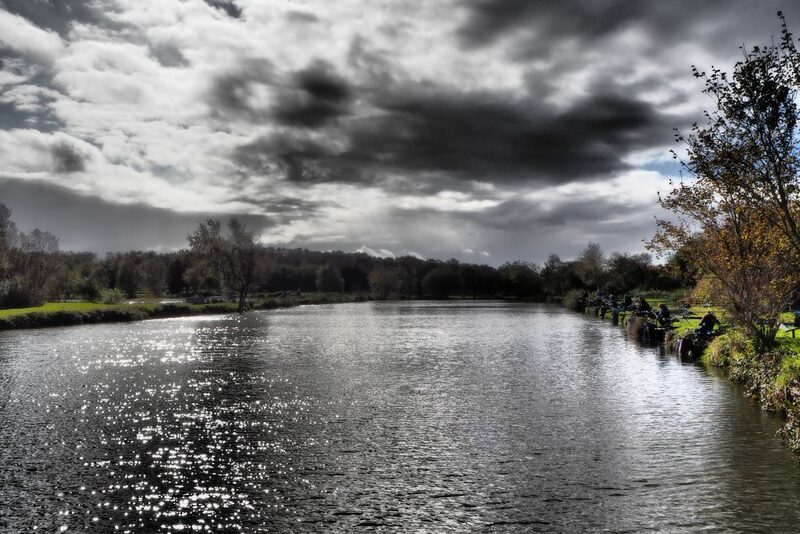 A damp start to the day today, with it drying up around 10am, overcast, mild with the odd spell of sunshine. 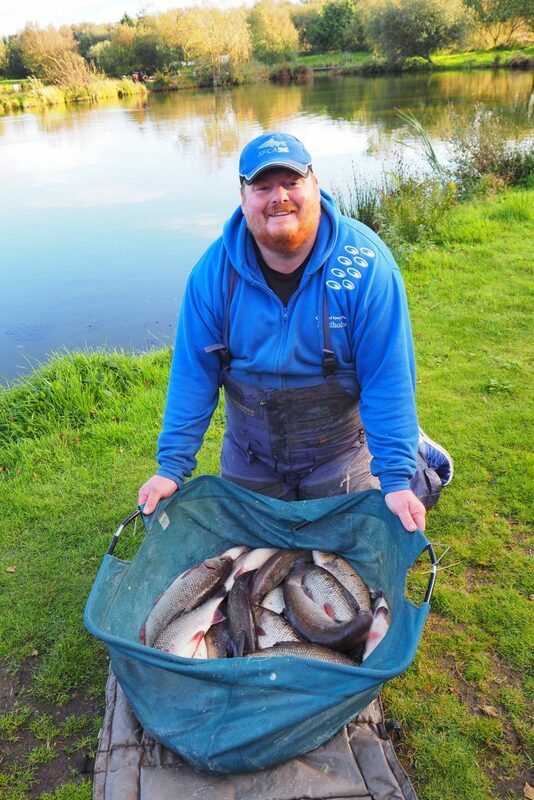 A bit patchy in places on the pole lines today due to a 12 hour period of rain overnight knocking the fish off a bit, but some lovely nets of fish were weighed in none the less..! 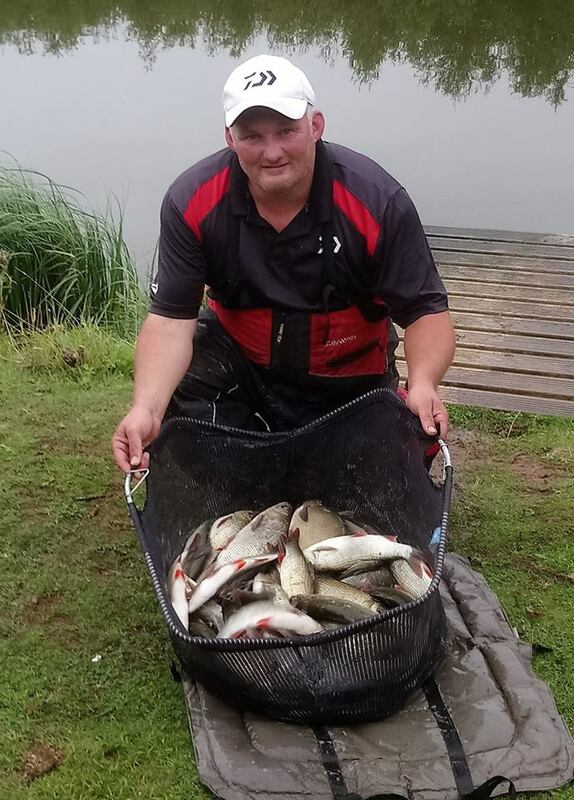 It was all to fish for today with local team Broom DYNAMITE having a narrow 1pt lead at the top of the league over Daiwa A, with Broom Ltd just behind. All of the teams involved were separated by very little after the first two rounds. The draw is always interesting with everyone keen to see where they, and their rivals have drawn..! 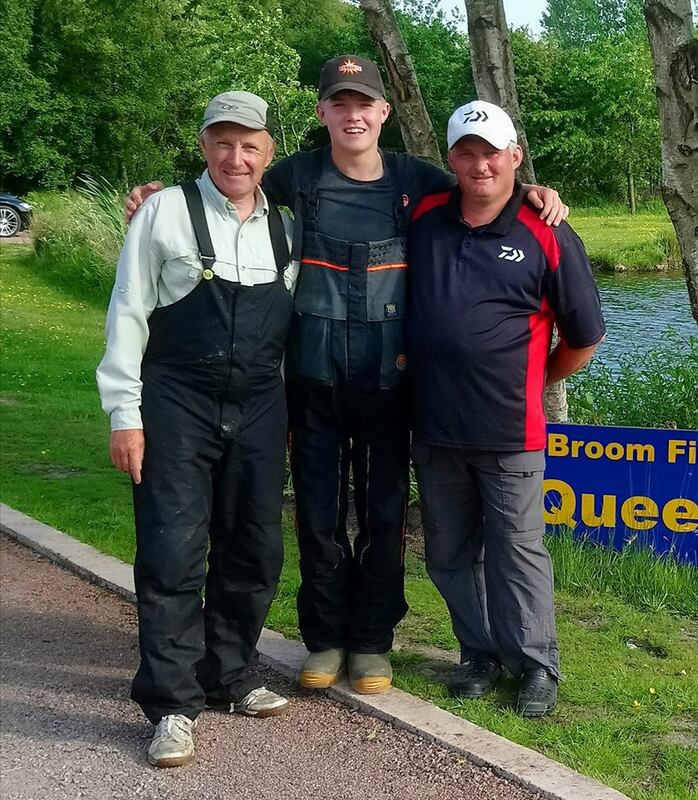 Team Broom DYNAMITE had drawn Bruce’s Acre peg 7, Queensberry Water peg 24, and Wallace Lake peg 43… No real ” Flyers” but a steady set of pegs. 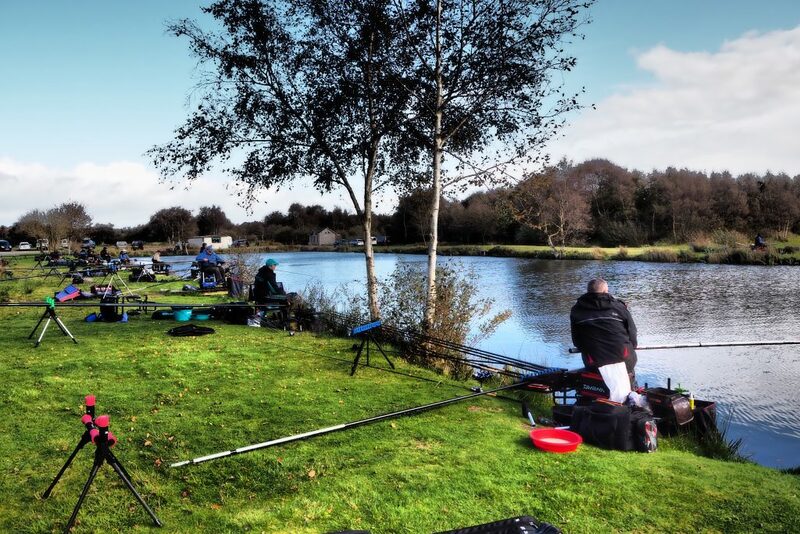 Team Daiwa A had drawn Bruce’s Acre peg 13, Queensberry Water end peg 27 and Wallace Lake peg 38.. Two good ones and one difficult one… An interesting day lay ahead..! 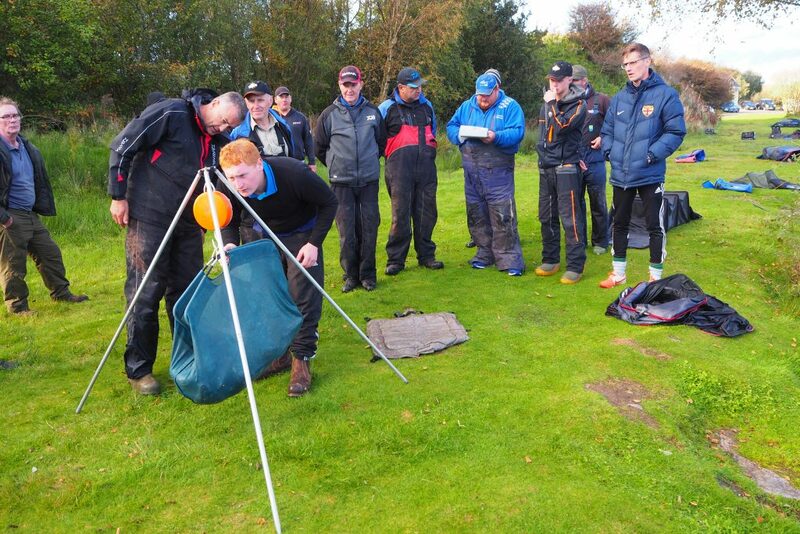 With the other teams drawing well too it would be a day for getting the tactics right, and so it proved. On Bruce’s Acre Steve Royle ( Broom DYNAMITE.) 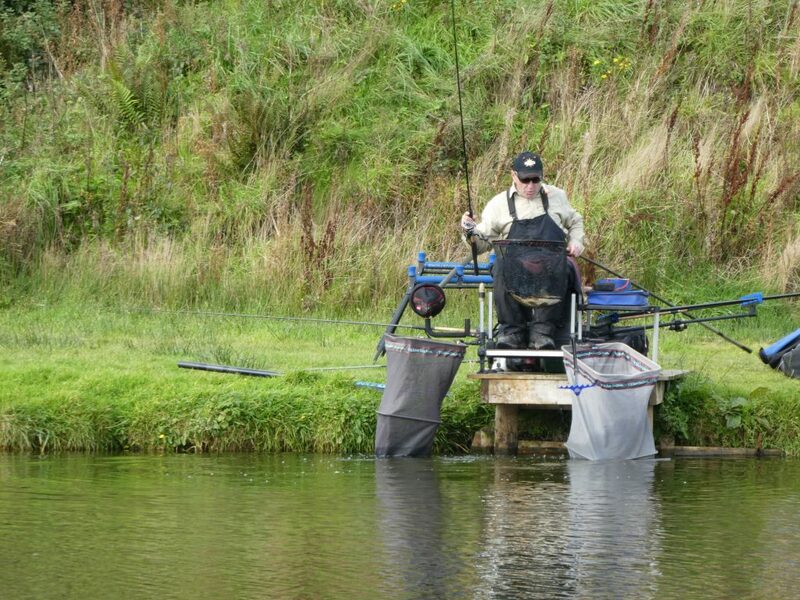 did well on a tough bank to win his section from peg 7. On the opposite bank it was Gerry Blythe ( The Arm Bandits.) 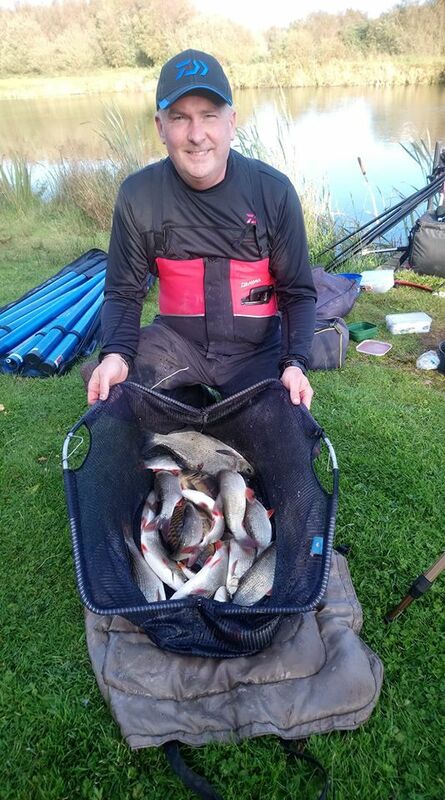 on culvert peg 14 who came out on top with 85lb 12oz after a right old tussle with David Mcauley ( DAIWA A.) 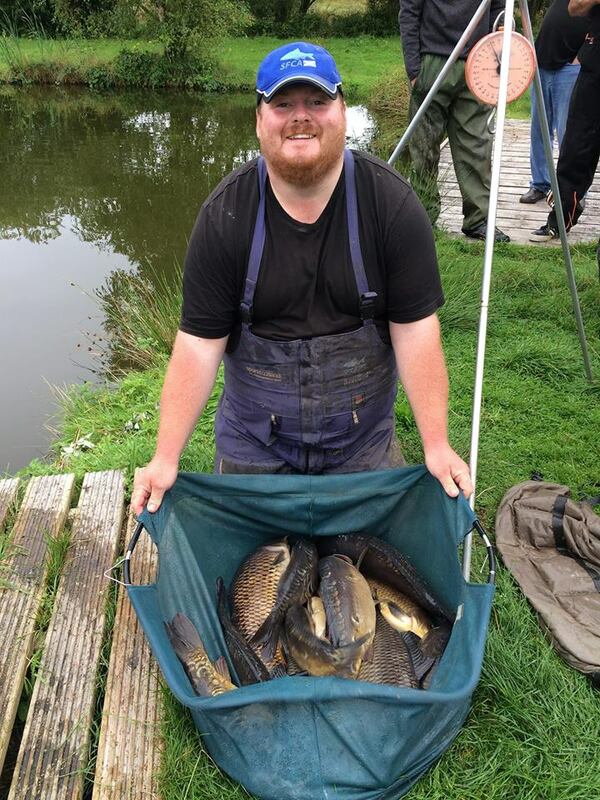 on culvert peg 13 who finished 2nd after losing a few fish, with a very respectable 75lbs, a mix of chub, skimmers and carp on pole. 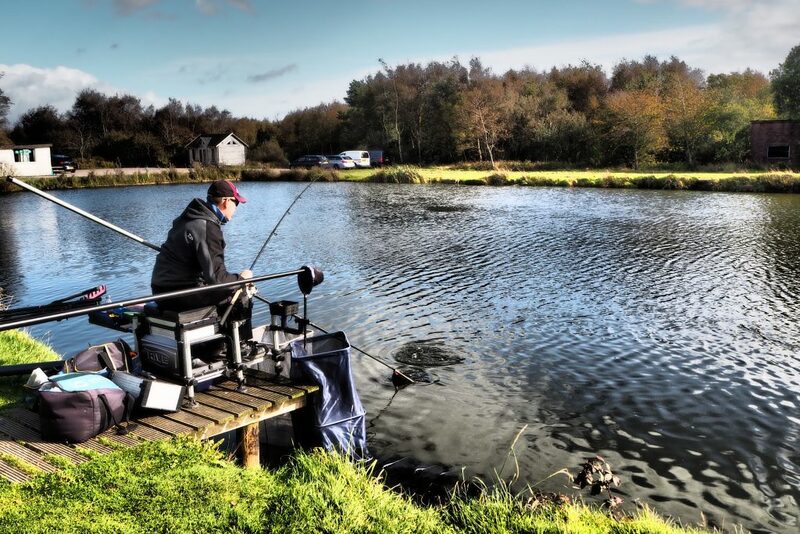 On Queensberry Water John Callaghan ( Daiwa B.) 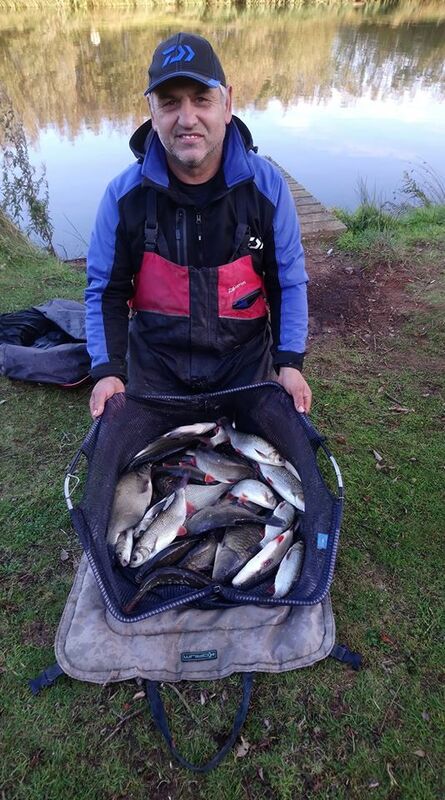 won section 1 with a net of silvers and carp for 31lbs 12oz. Section 2 saw young Rob Swan (. Broom DYNAMITE.) 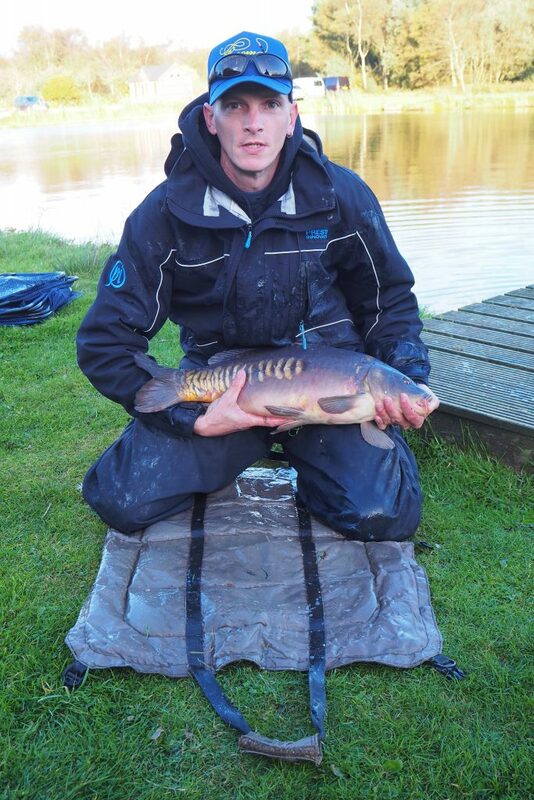 win the section with a nice net of carp caught on the pellet waggler for 65lbs 6oz, with Ian Whitson (. DAIWA A.) 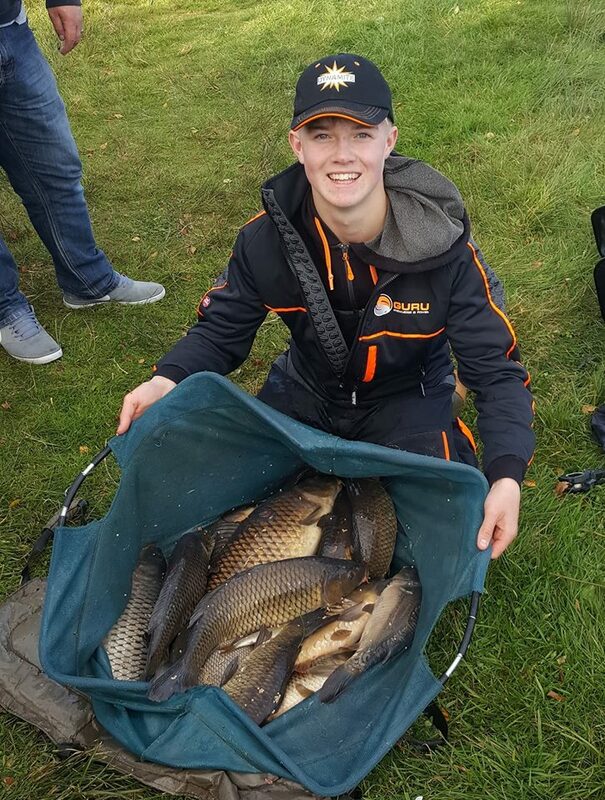 a very decent 2nd with 53lbs. On Wallace Lake Section 1 Matt Baxter (. 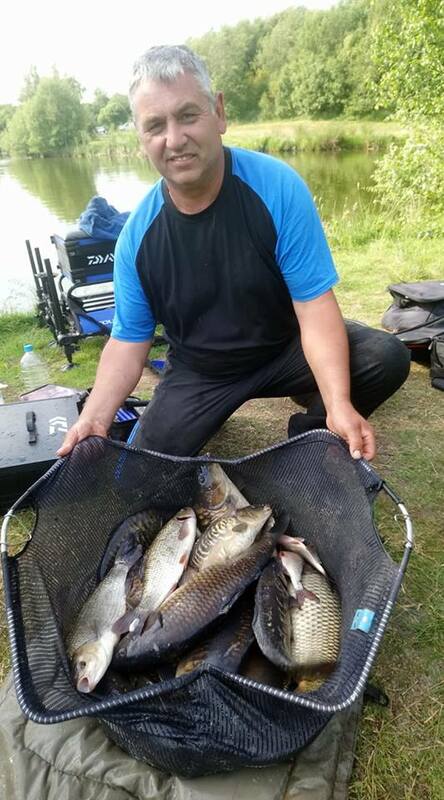 Bulgarian Baggers) caught carp steadily all day on paste to weigh in 76lbs, and very unlucky not to win the Golden peg pot too. Gary Black (. DAIWA B.) 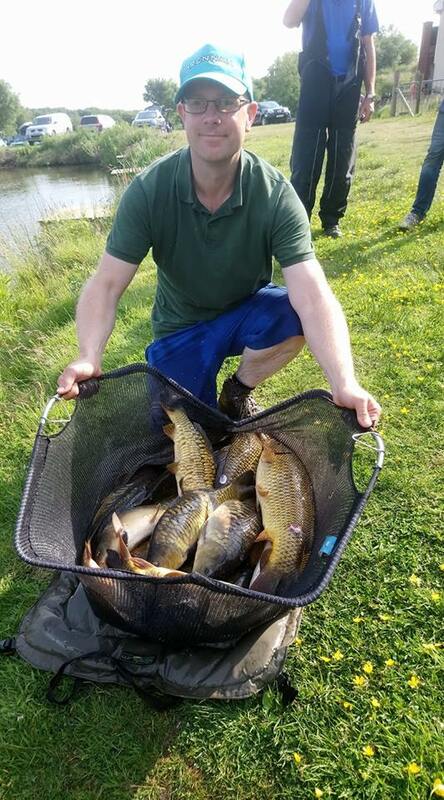 secured valuable points for the team finishing 2nd with 38lbs 4oz. Wallace Lake Section 2 was a very close affair, with Don Lines (. 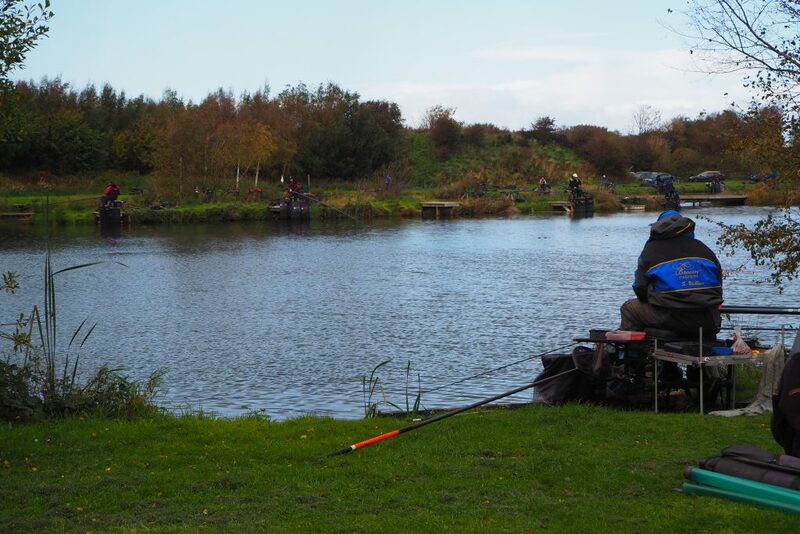 Broom Ltd.) on end peg 46, but Barry Young (. Broom DYNAMITE.) 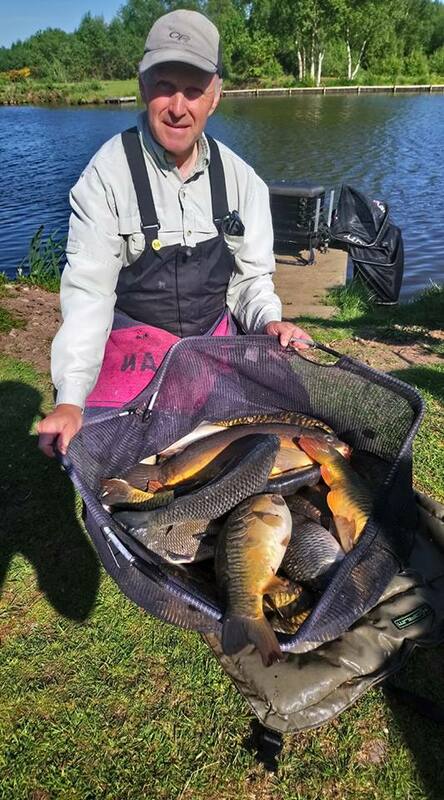 got his tactics spot on, on peg 43 ignoring the carp to target ide.., narrowly winning the section with 57lbs, with Don Lines weighing 54lb 10oz, mainly Carp caught on the feeder. This gave team ” Broom DYNAMITE” a perfect score of 3pts, and also giving them 3 wins out of 3 and a 5pt lead in the league, a great team effort. 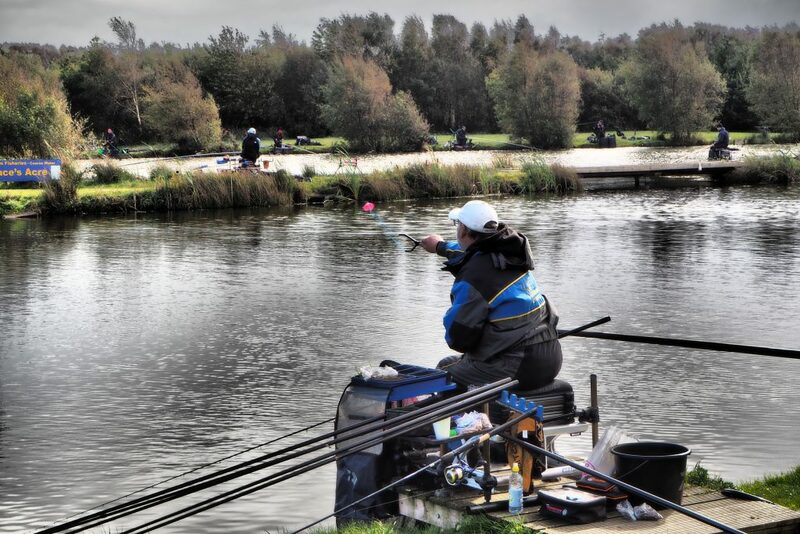 Daiwa ” B” *finished runners up today after a solid performance from the team. 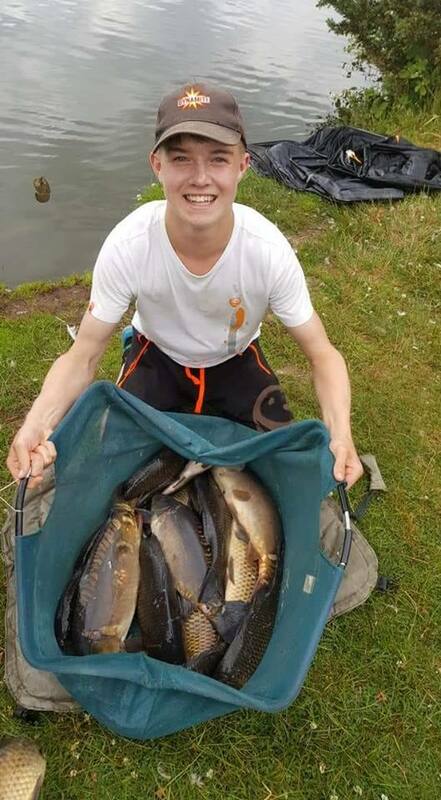 10 teams / 30 anglers fished. Match 4 ( final round.) results and Overall results. A lot cooler today than of late, overcast with a few showers, but bright spells and the strong winds forecast didn’t materialise thankfully..!! 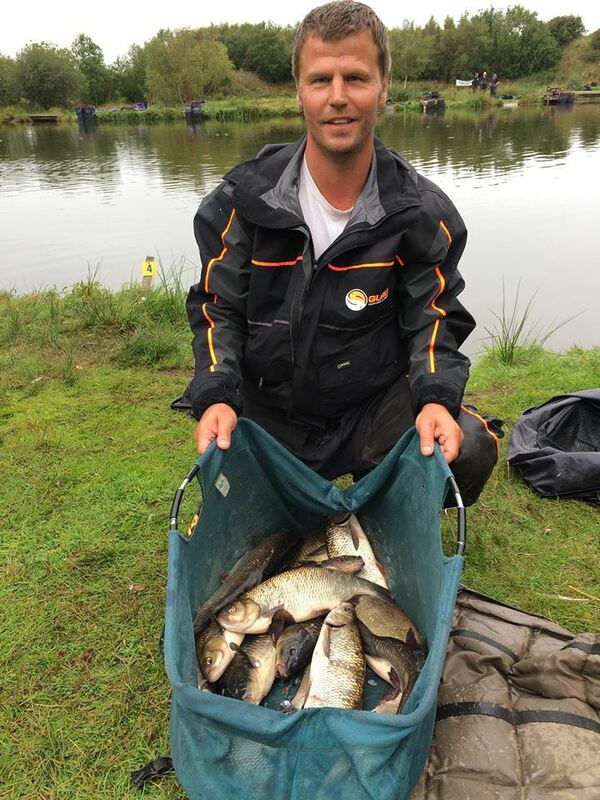 At the start of play today local team ” Broom DYNAMITE” had a 5pt lead over nearest rivals Daiwa “A”.. With the trailing pack not far behind. There was no room for complacency today, its never over until its over..!! 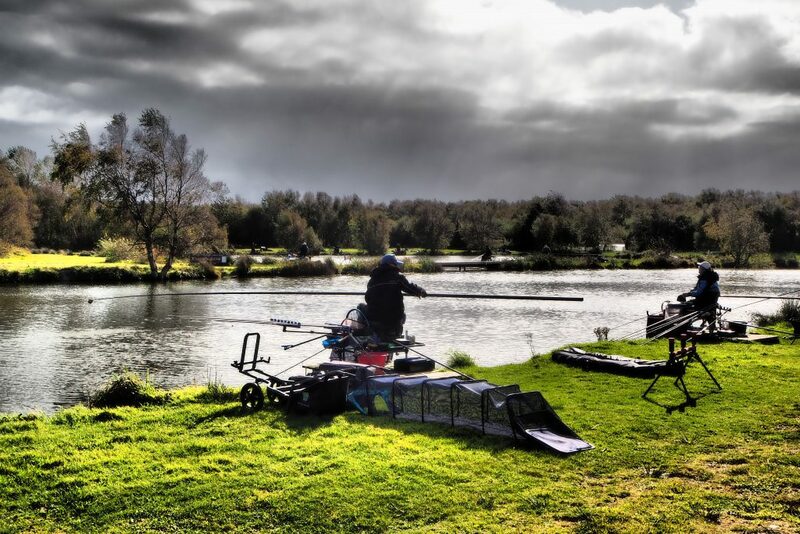 At the draw ” Broom DYNAMITE” had drawn ok, with Barry Young on end peg 46 on Wallace Lake, Steve Royle drawing peg 22 on Queensberry Water and Rob Swan drawing a tough peg 10 on Bruce’s Acre. 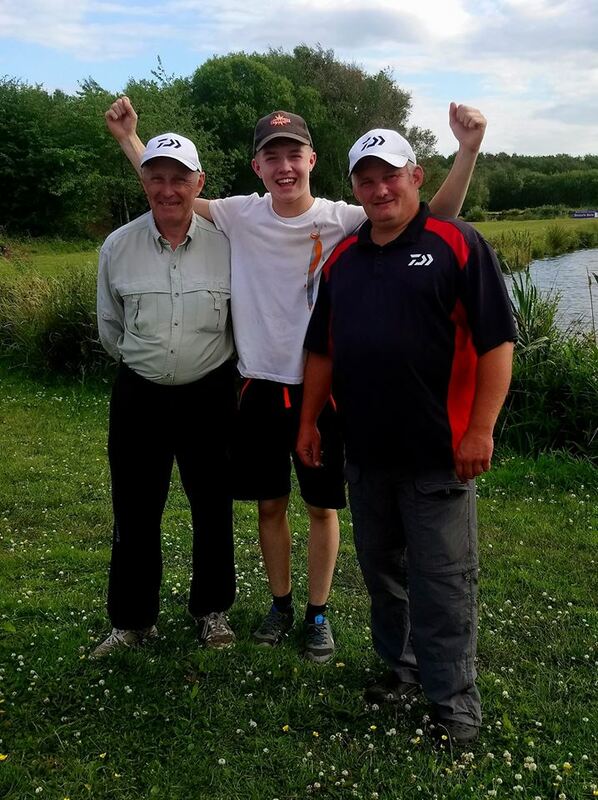 Meanwhile Daiwa ” A” had also drawn reasonably, with David Mcauley on end peg 18 on Queensberry Water, Ian Whitson on consistent peg 42 on Wallace Lake and David Corcoran ( standing in for Martin Greene.) on middle peg 4 on Bruce’s Acre. 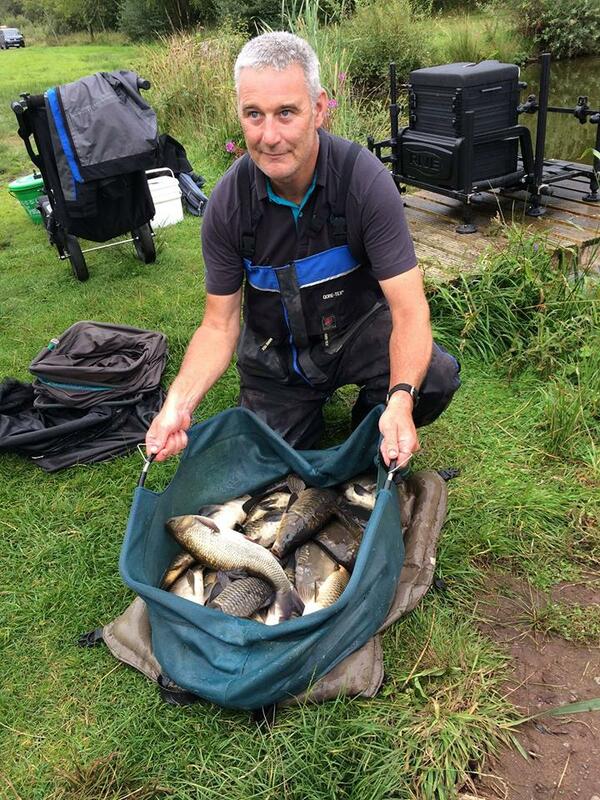 Gerry Blythe who lead the individuals side of things also drew well, end peg 2 on Bruce’s Acre, who was tied at the top with Rob Swan on a perfect 3pts at the start of the match. As things panned out throughout the match, it became clear it would go right to the wire. Barry Young ( Broom DYNAMITE.) 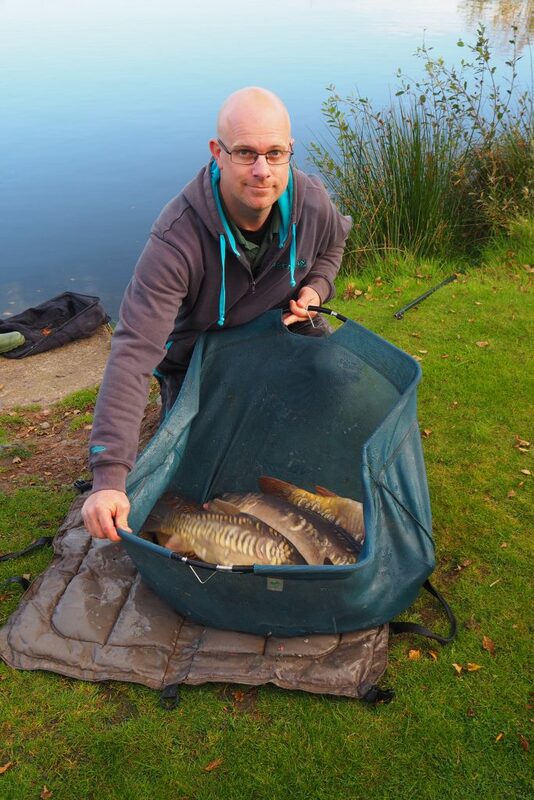 on Wallace Lake started well with 35 ide in the first two hours, but only another 2 and a small carp followed in the remaining 3 hrs with the fish switching off completely. 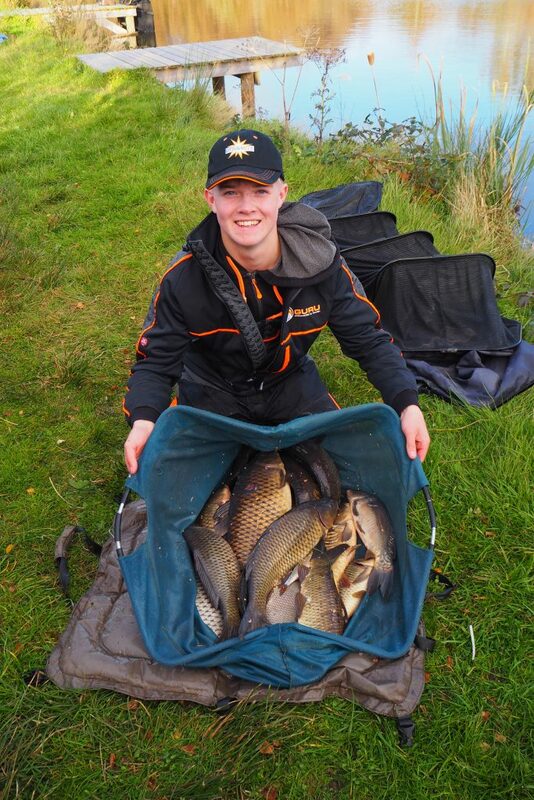 Ian Whitson ( Daiwa A.) in the same section clawed his way back into things with a late flurry on the feeder to take the section win, with Barry settling for 2nd place. Wallace Lake Section 1 was won by Craig Duncan (. 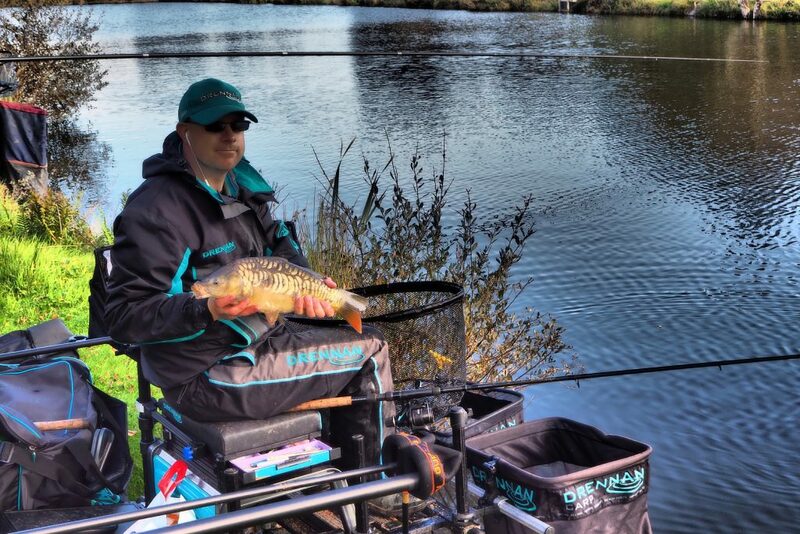 Daiwa ” C.) with 17lbs from end peg 34… Normally a big weight peg, but showing just how tough Wallace Lake had fished today. On Queensberry Water David Mcauley (. 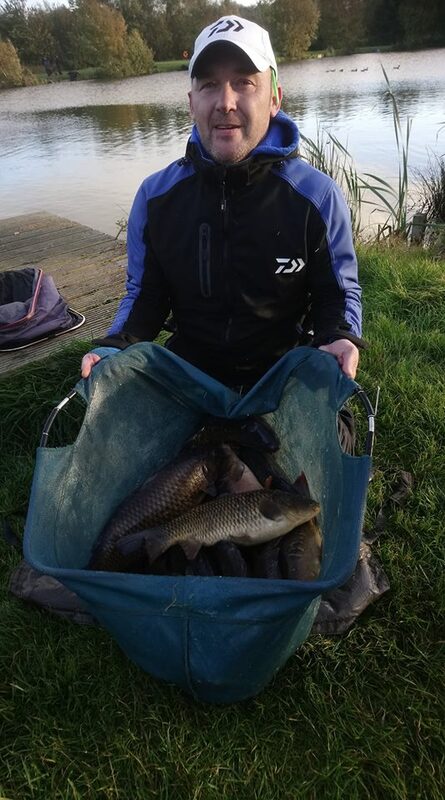 Daiwa ” A” ) made the most of his peg with a great effort, winning the section with a superb 65lbs 10oz, with James Woodrow (. Daiwa ” C”.) 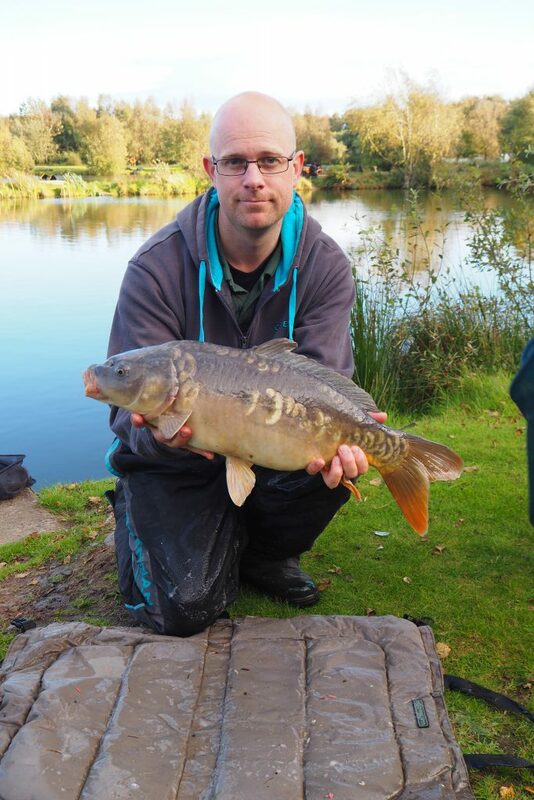 a respectable second with 56lb 6oz. 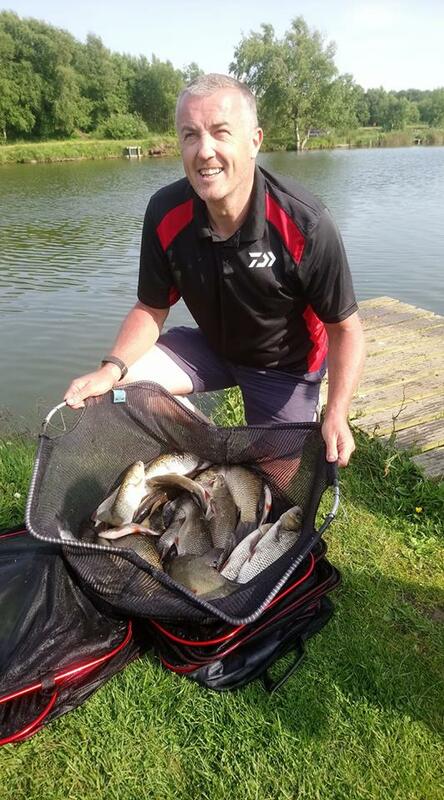 Matt Baxter put together a nice net of skimmers and Carp, caught on paste / pole weighing in 62lb 10 oz to win section 2. 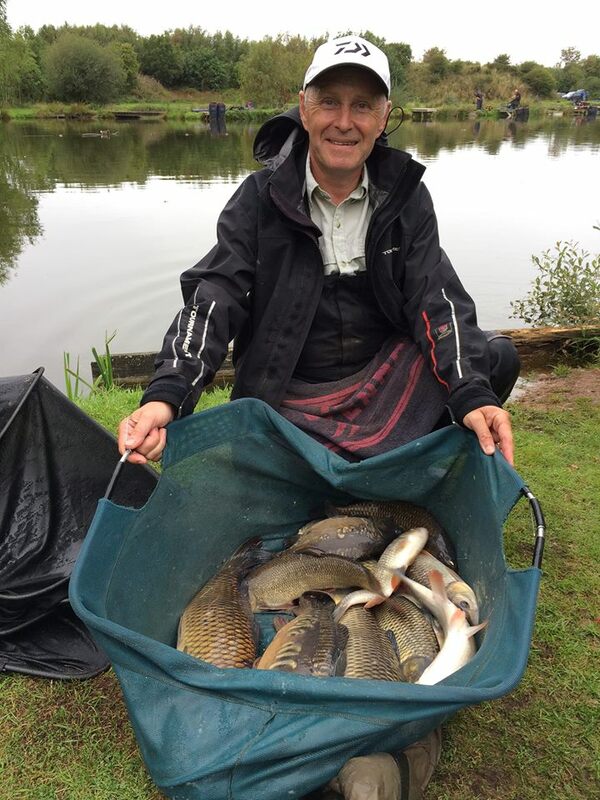 On Bruce’s Acre Gerry Blythe kept up his individual winning streak with a 4th section win, with nearly all his fish coming in the last hour to weigh in 33lb 8oz, with David Corcoran (. 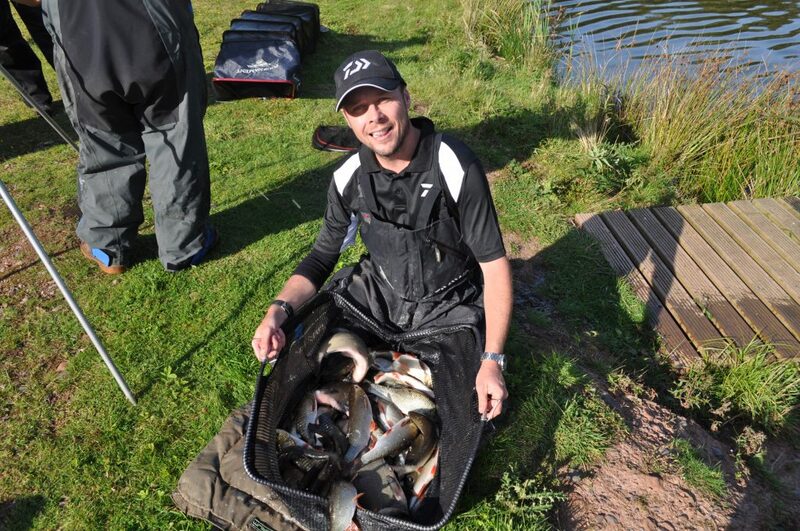 Daiwa ” A” ) finishing 2nd in section with 16lb 12oz. Bruce’s Acre section 2 was a real close one, with Gary Black (. 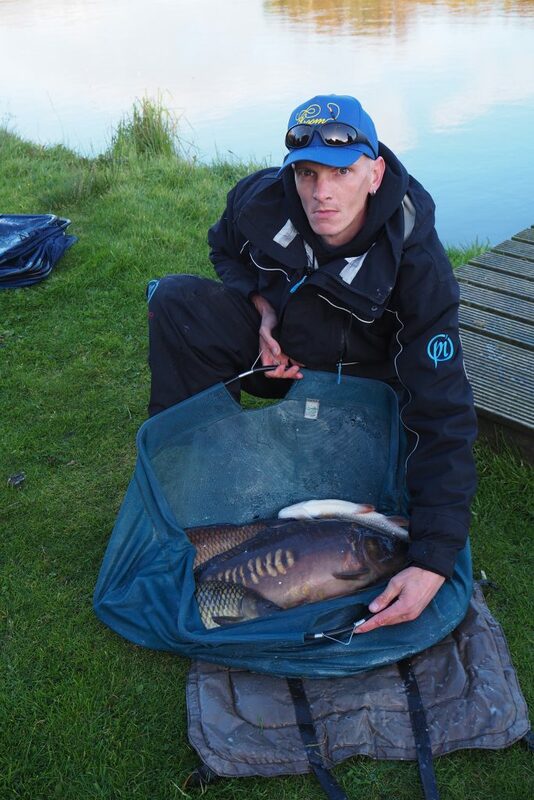 Daiwa ” B” ) drawing hot peg 14, and winning the section with a decent 54lbs 4oz, all carp caught on pole. However, young Rob Swan (. Broom DYNAMITE.) 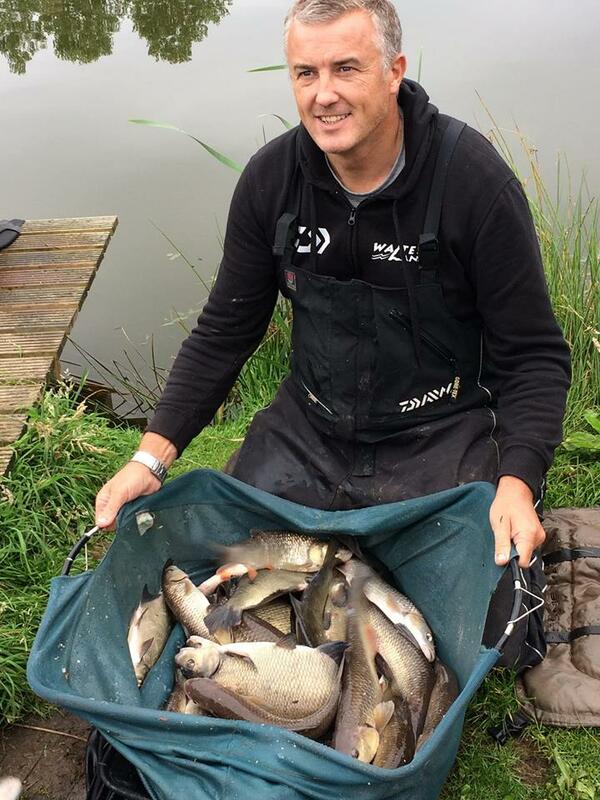 did better than expected from a tough peg 10, weighing in 47lbs 2oz to sneak second in section and up against some very good pegs. 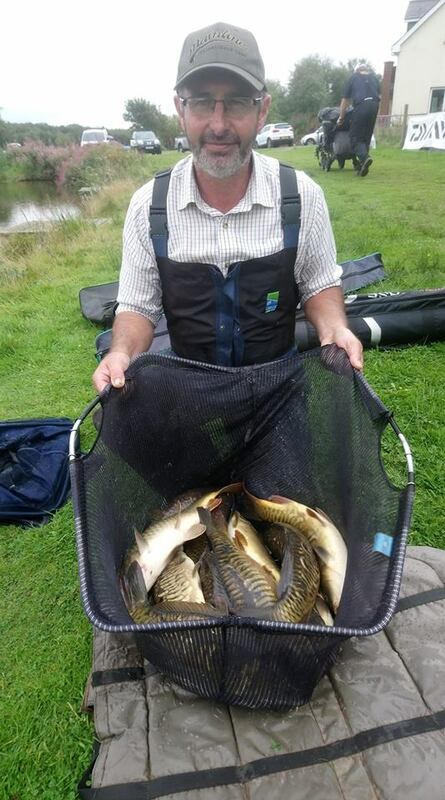 Shaun McAneney was a close 3rd with 44lbs 12oz on culvert peg 13, a nice mix of carp, chub and skimmers caught on pole. As everyone had expected things were going to go right to the wire.. And so it proved. Once the points had been calculated the results were announced in the cafe, with everyone tucking into a nice hot bowl of chilli to get warmed up..!! 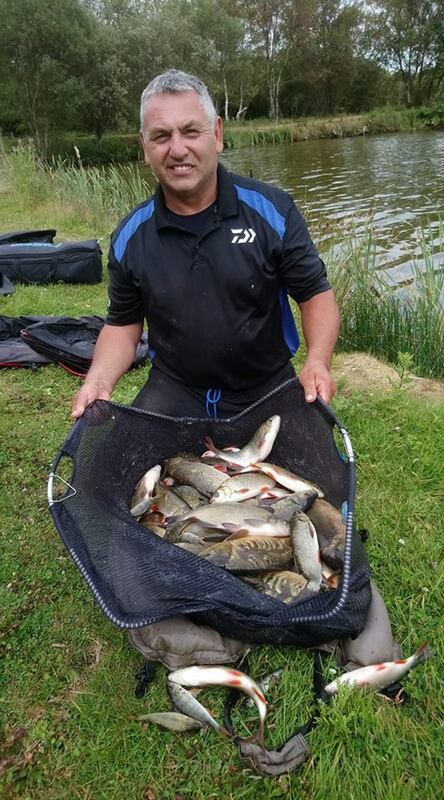 Broom DYNAMITE retained their title for the second year running by the smallest of margins.. Just managing to hold off a great comeback by Daiwa ” A”… Winning by a mere 1pt..!! 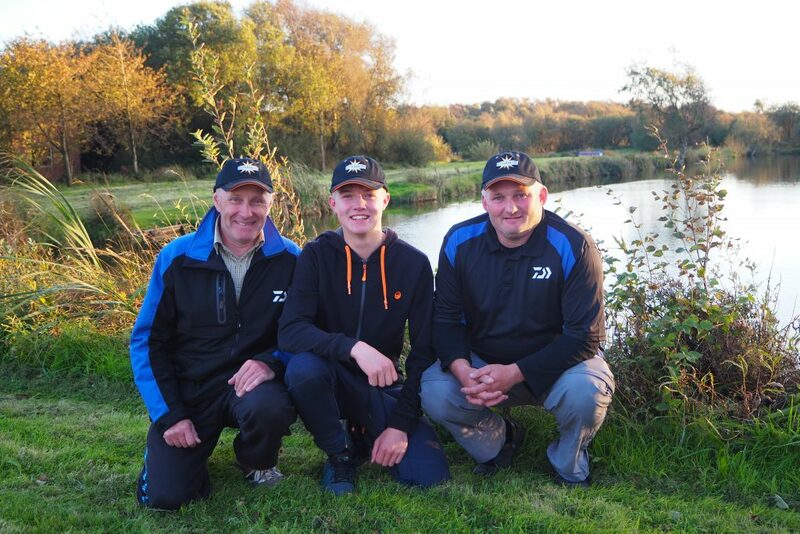 Congratulations to the team, Rob Swan, Steve Royle and Barry Young.. Who fished consistently throughout the league, and a big well done to Daiwa “A” who came so close. Congrats also to Gerry Blythe winning the individuals title with a perfect score of 4pts, and young Rob Swan on finishing a close second on 5pts. 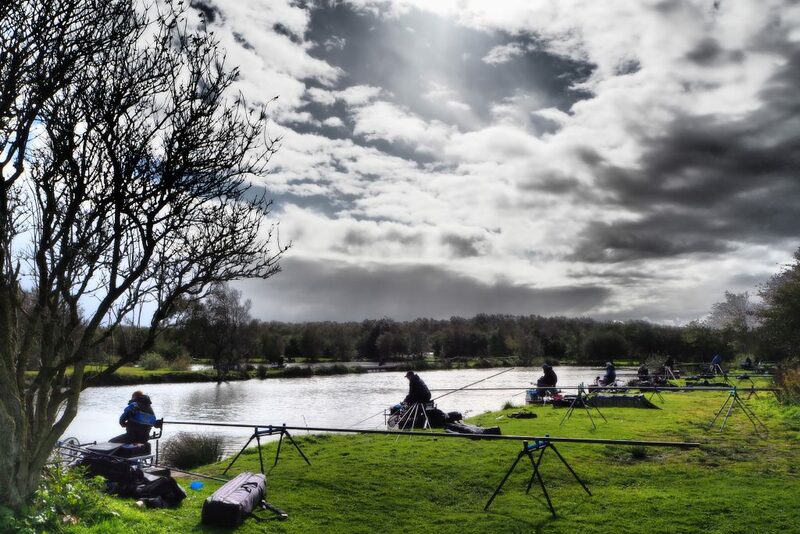 Well done to all the teams and many thanks for supporting another fantastic league, well run and organised, and also to Daiwa for their continued support.